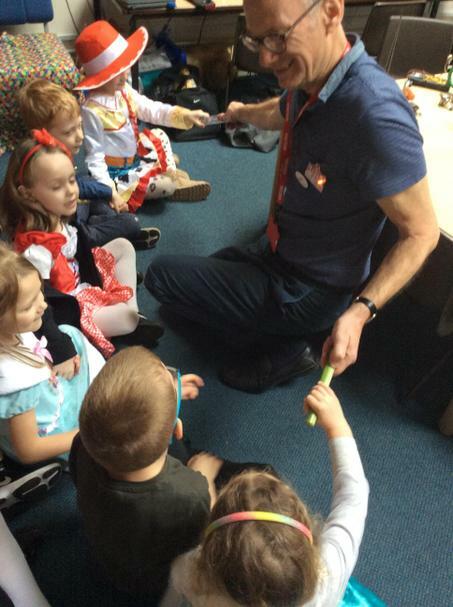 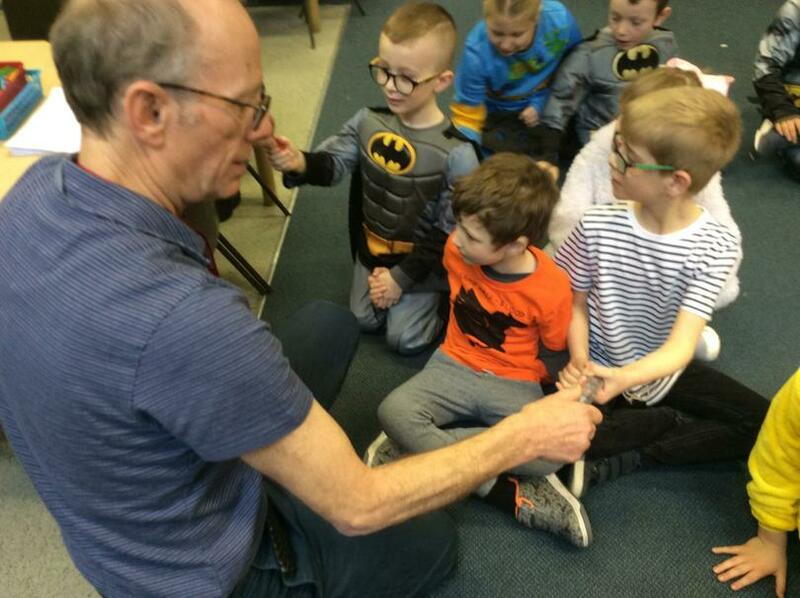 It was a real treat to have a visit from STEM Ambassador Philip Purvis during World Book Day. 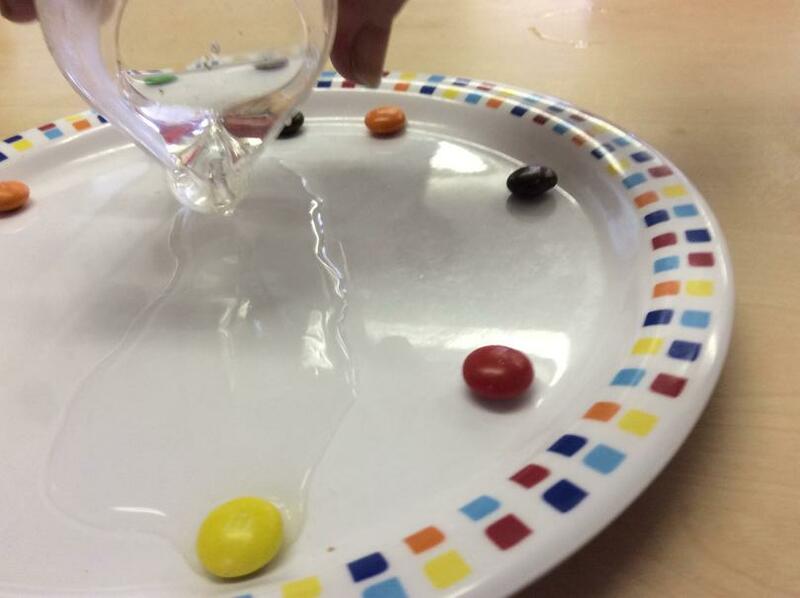 He linked the importance of Science, Technology and Engineering with printing techniques and transferring information. 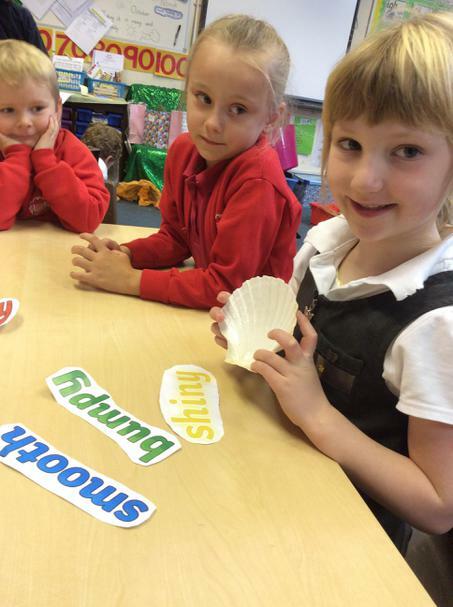 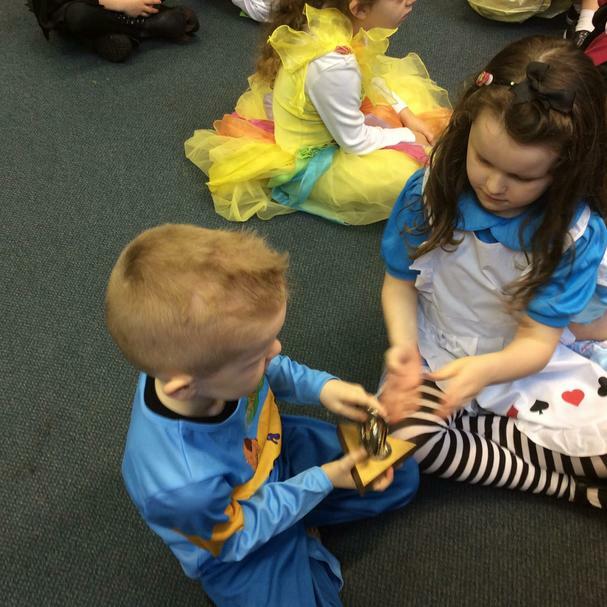 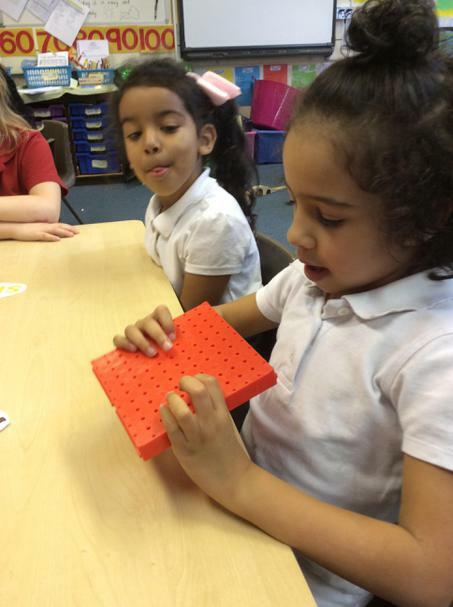 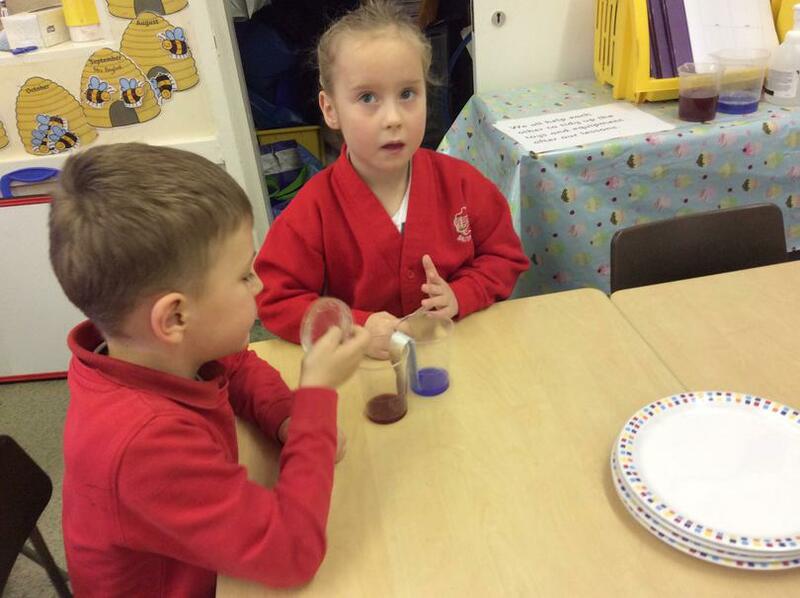 The children had a great time of discovery through exploring a range of everyday items. 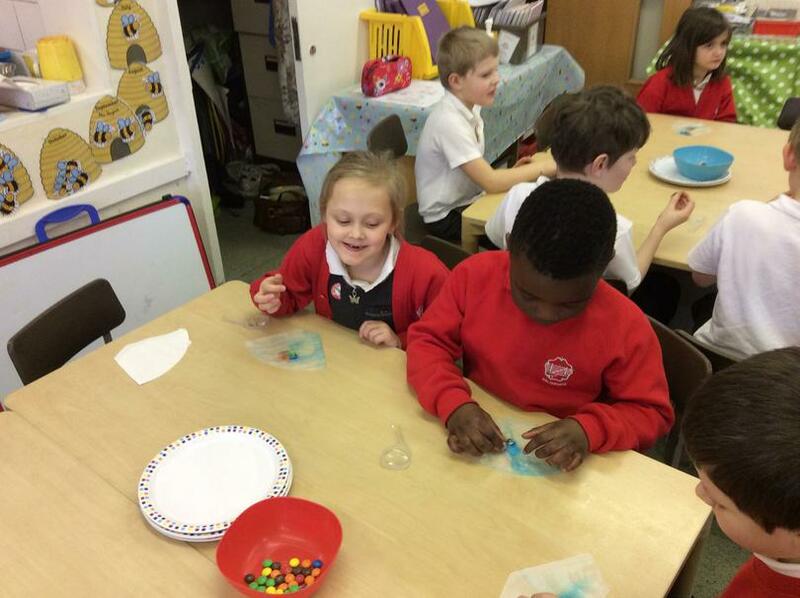 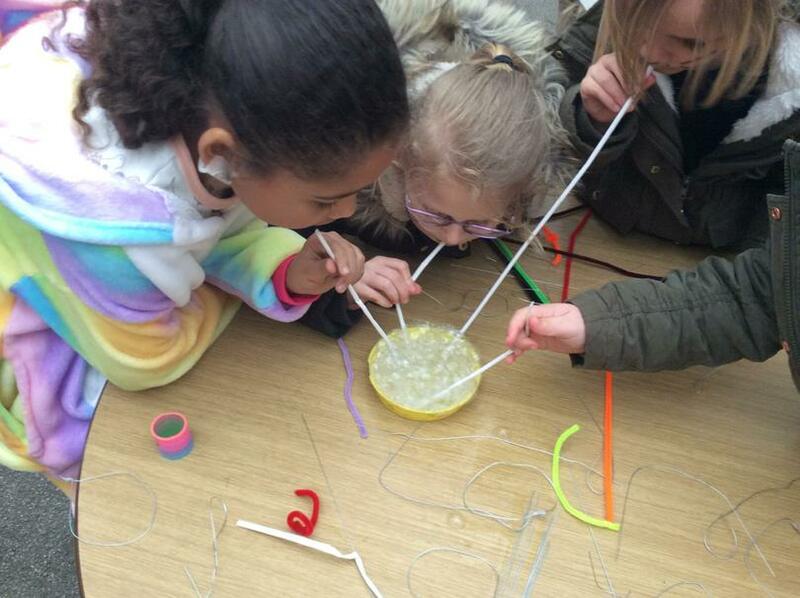 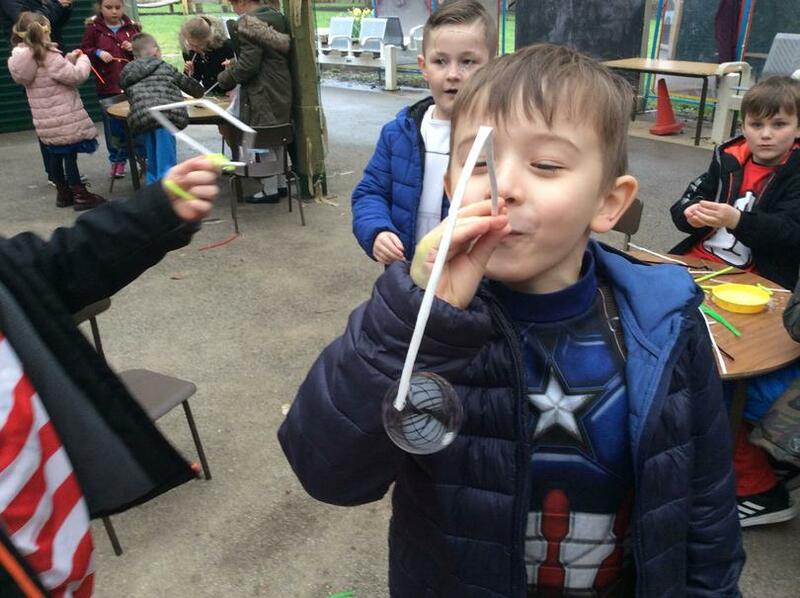 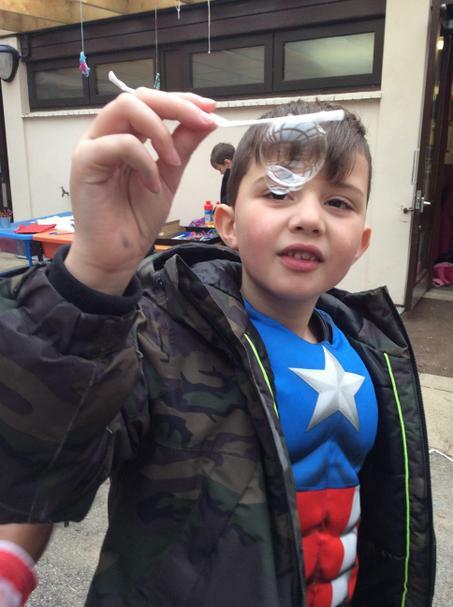 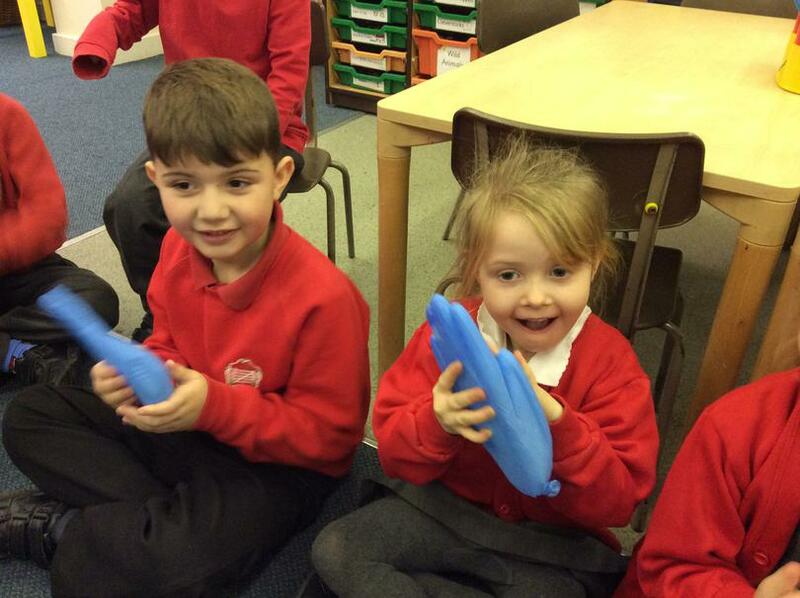 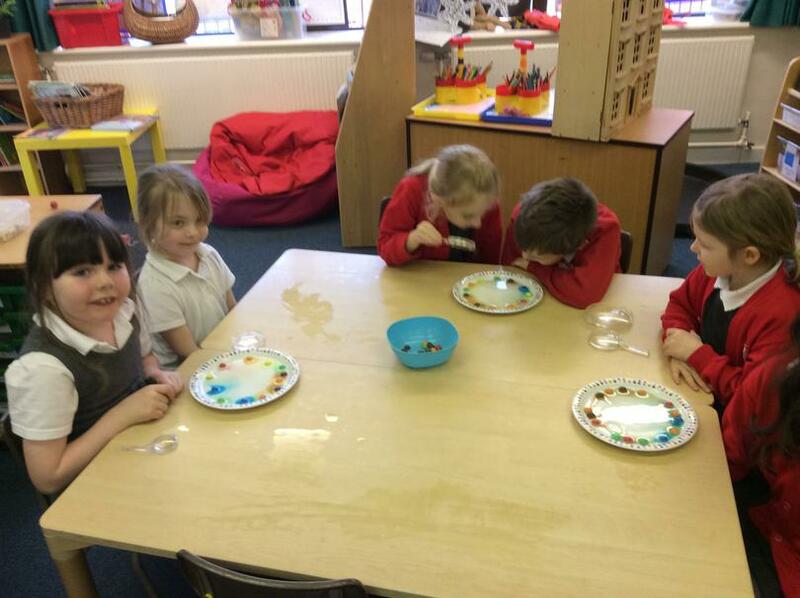 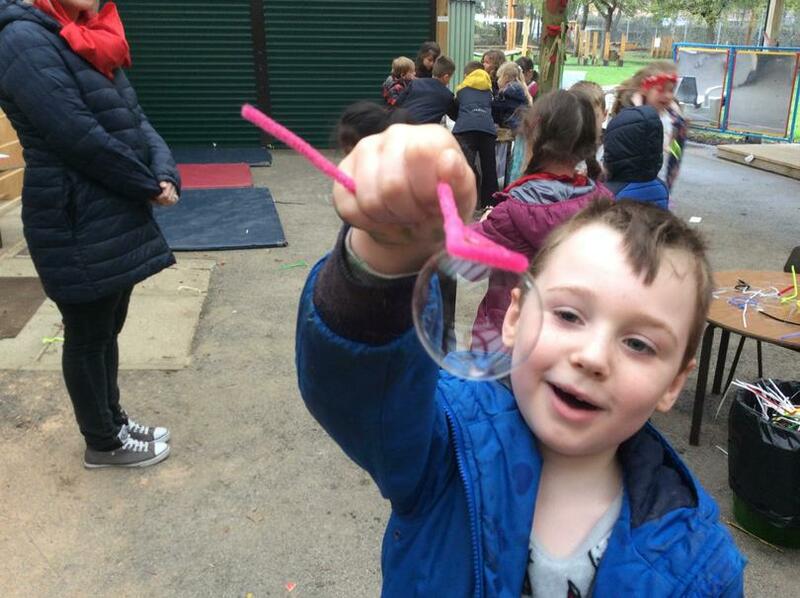 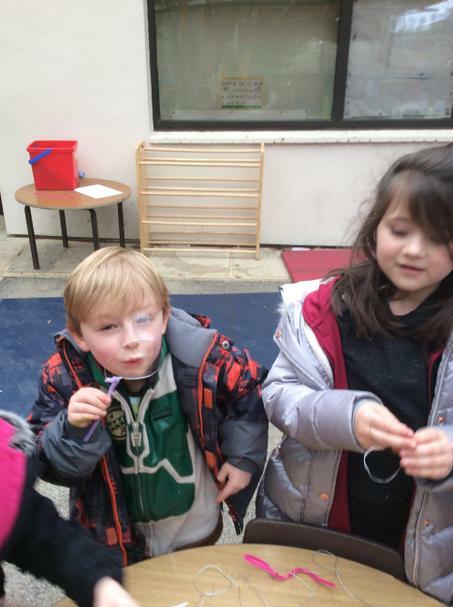 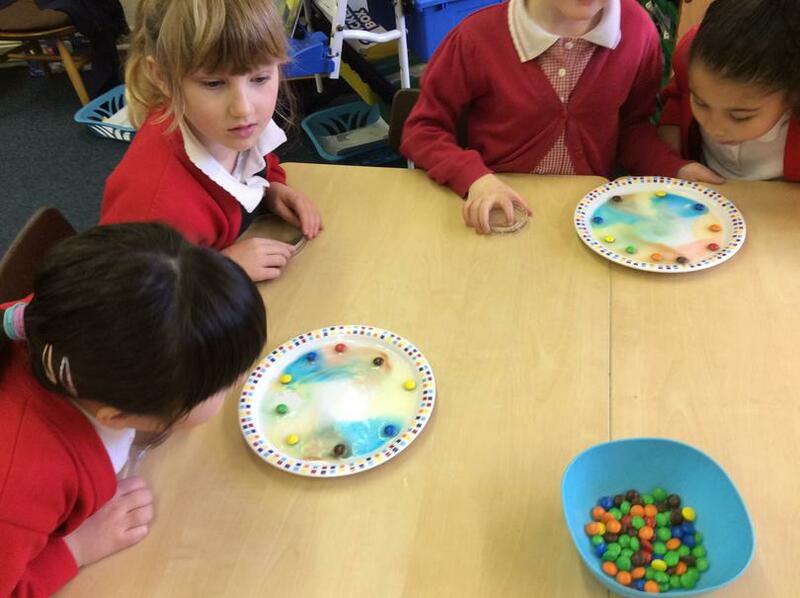 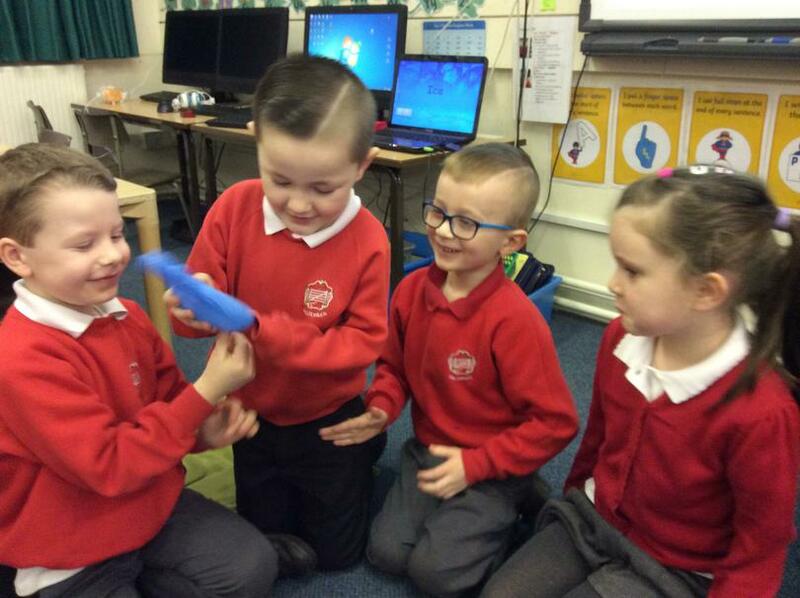 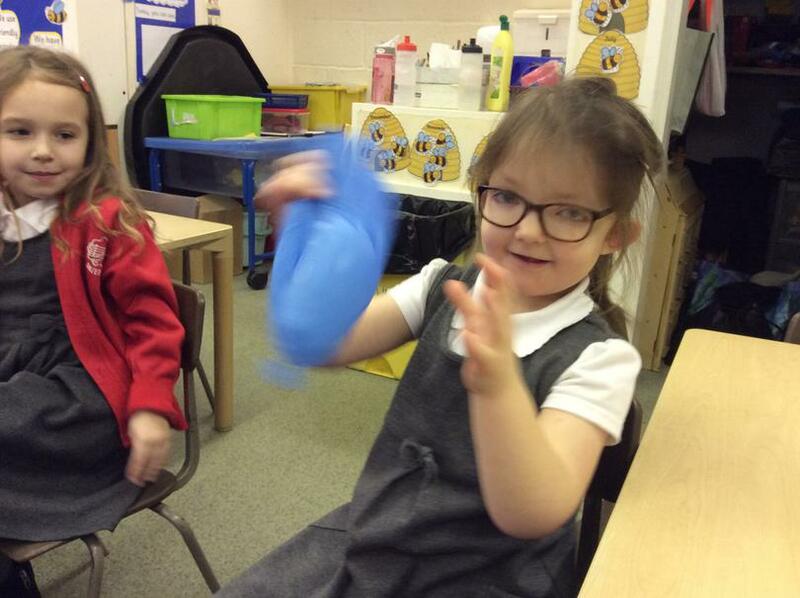 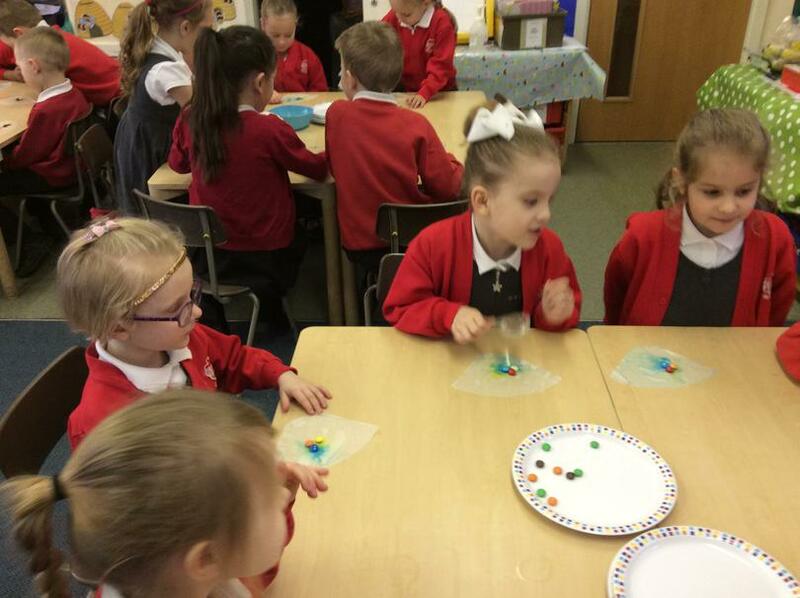 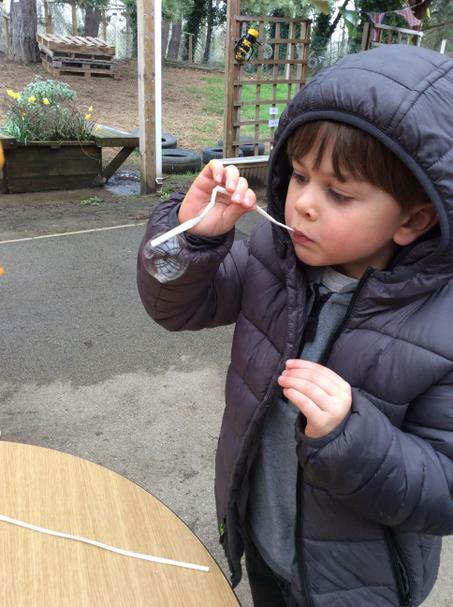 The children in KS1 enjoyed experimenting with the best way to make bubble blowers. 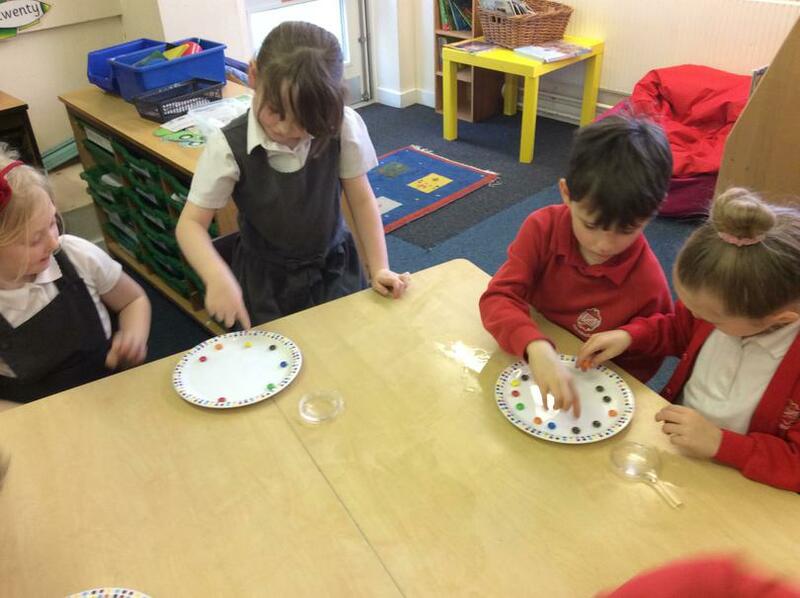 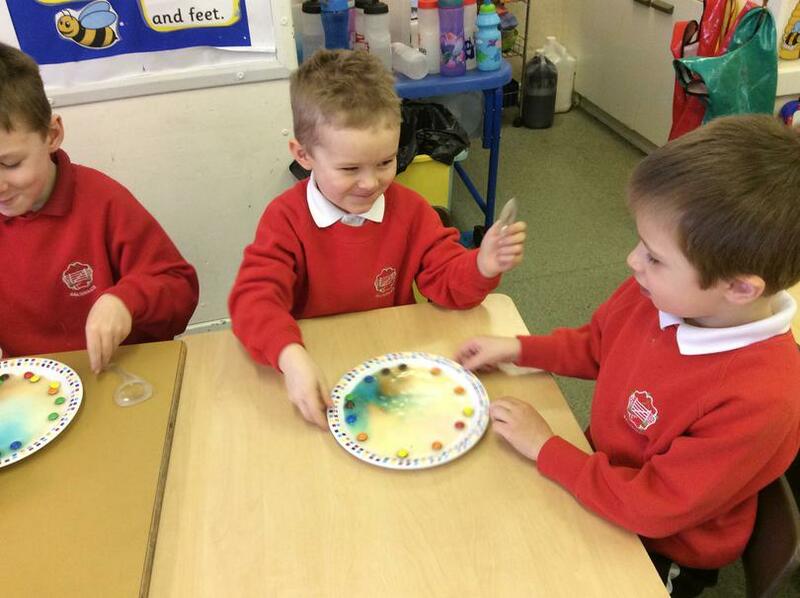 Look at the wonderful bubbles they made. 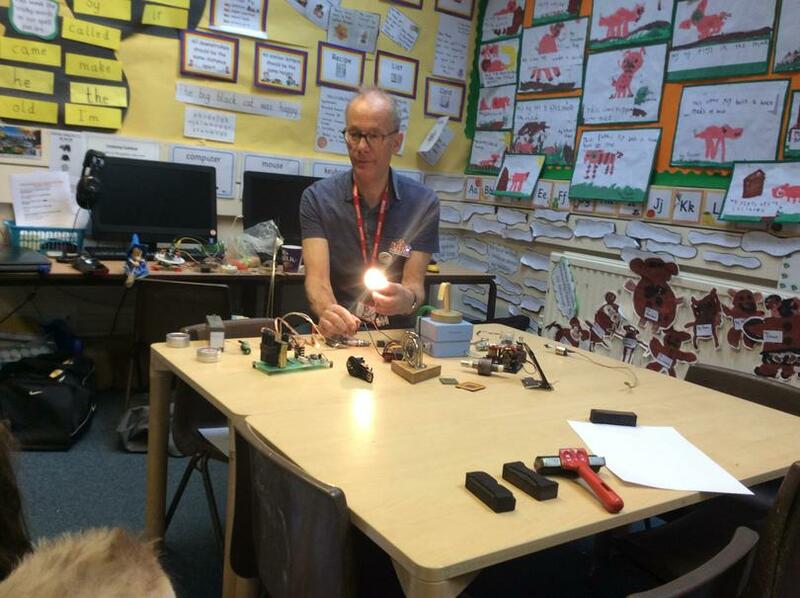 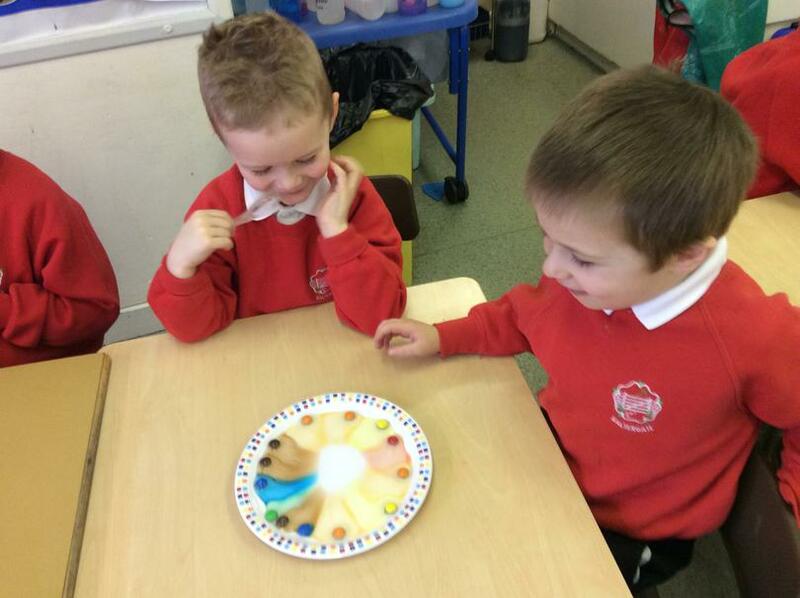 The children from Key Stage 1 had great fun investigating and exploring 'light' during the Science Curriculum Day. 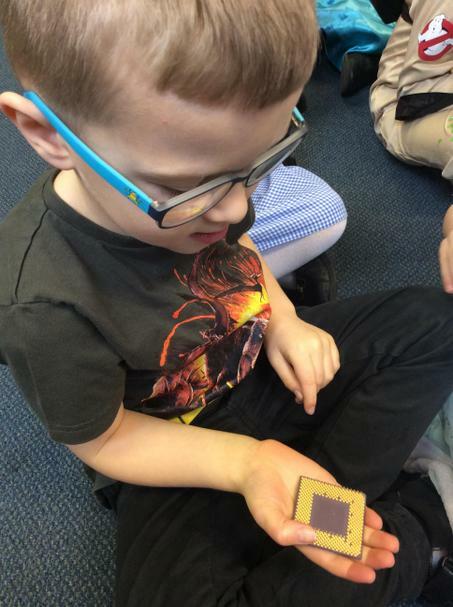 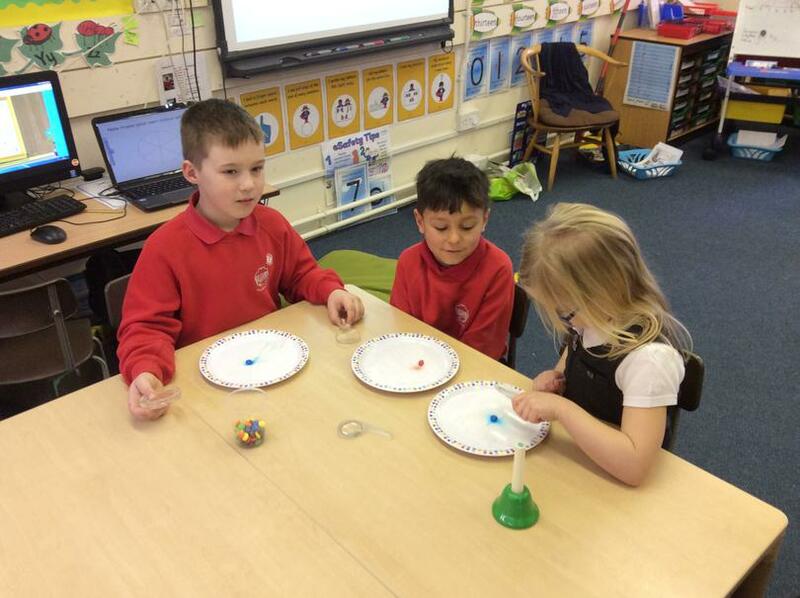 Throughout the day the children took part in different activities related to the five types of Scientific Enquiry by moving from class to class. 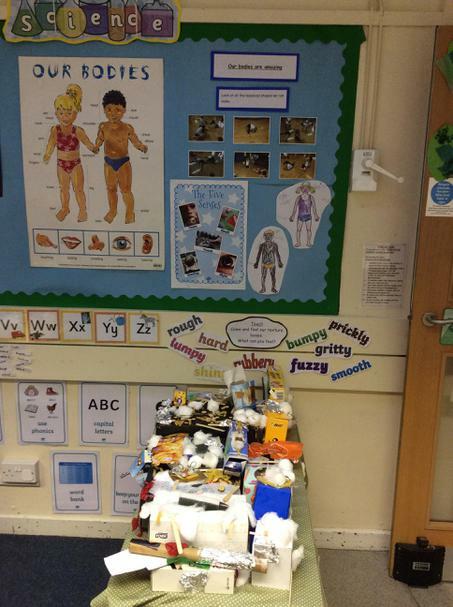 Take a look at some of the wonderful things they observed and researched. 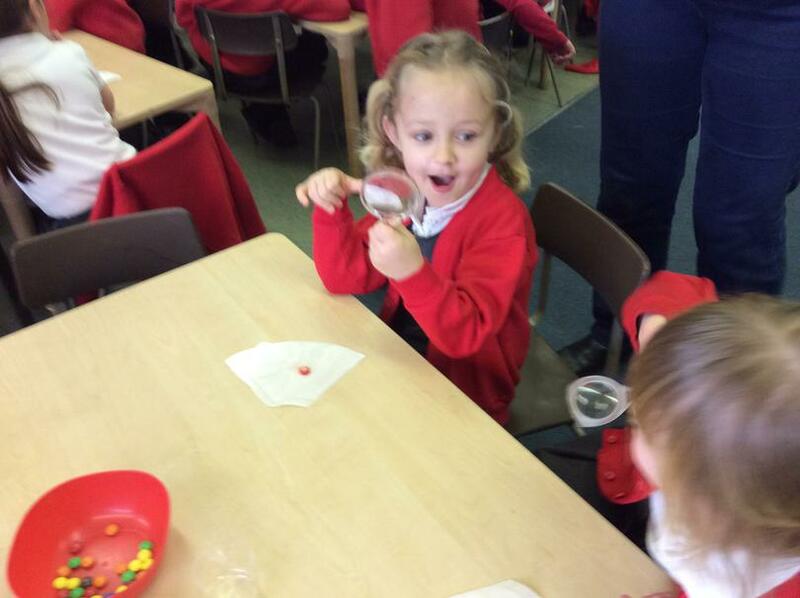 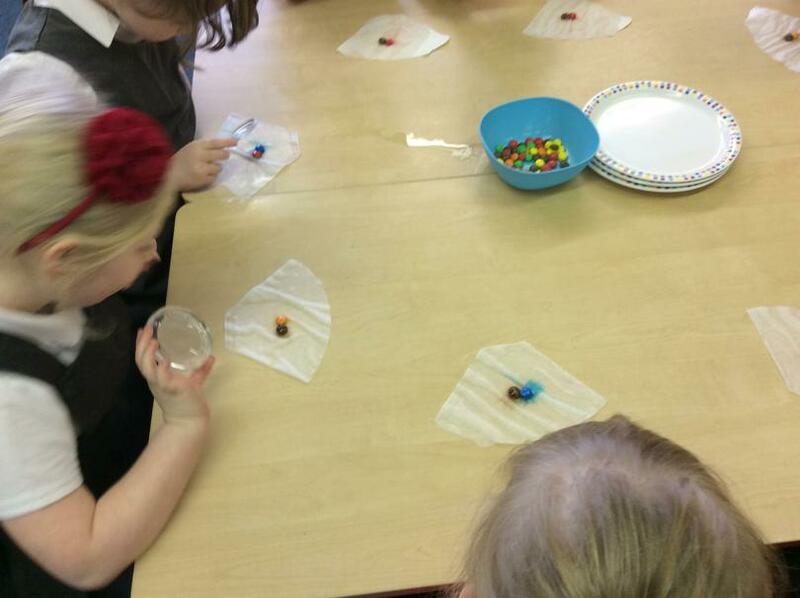 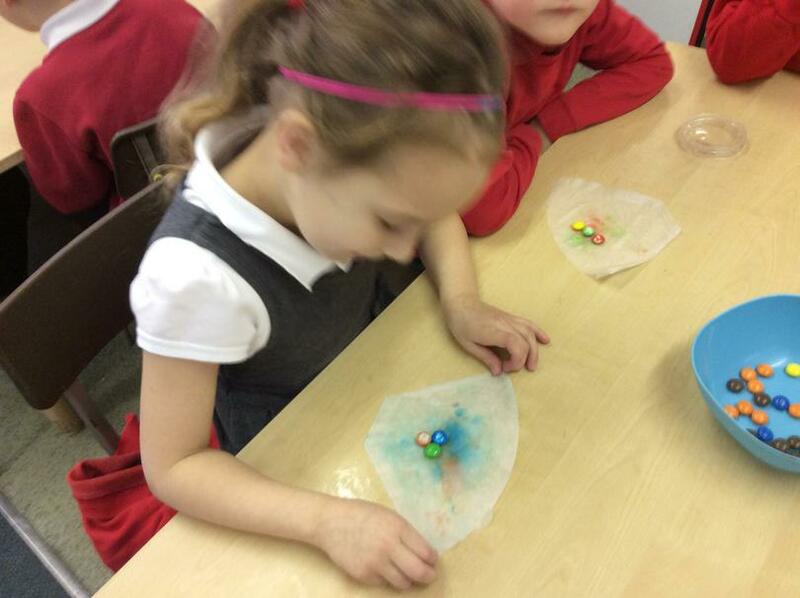 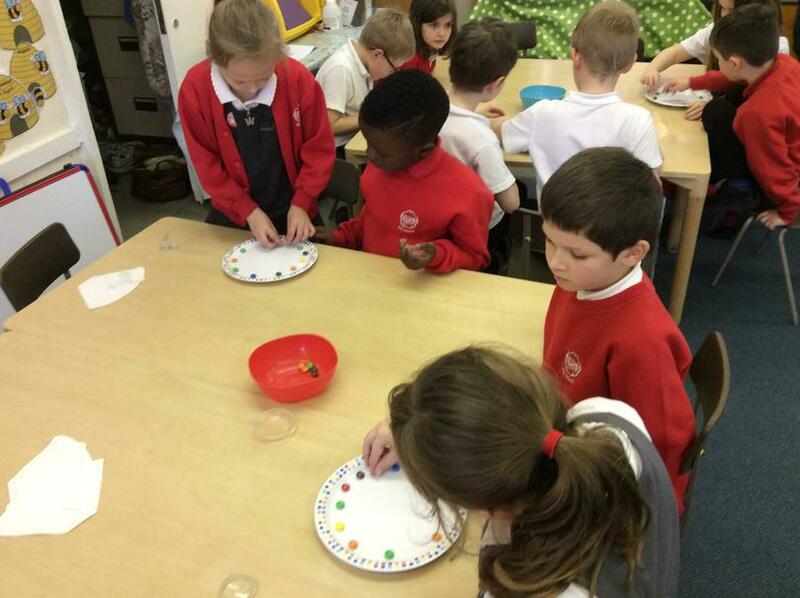 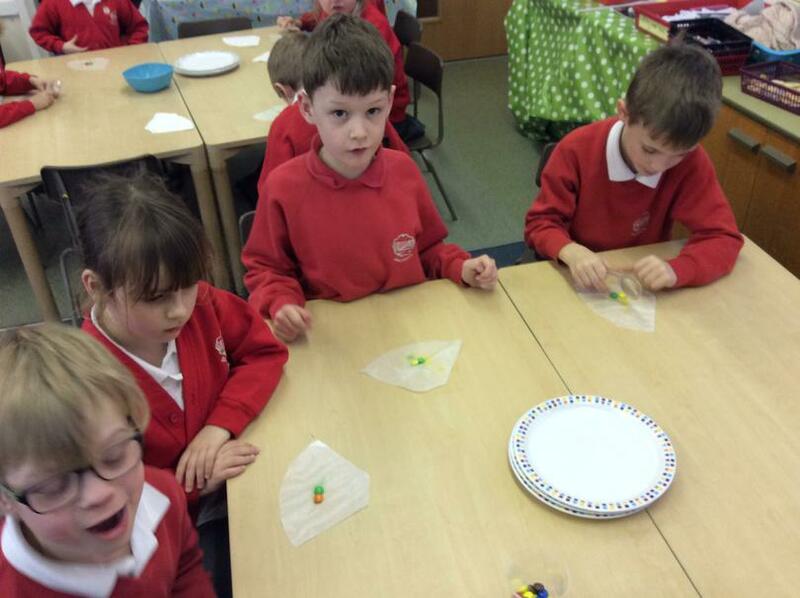 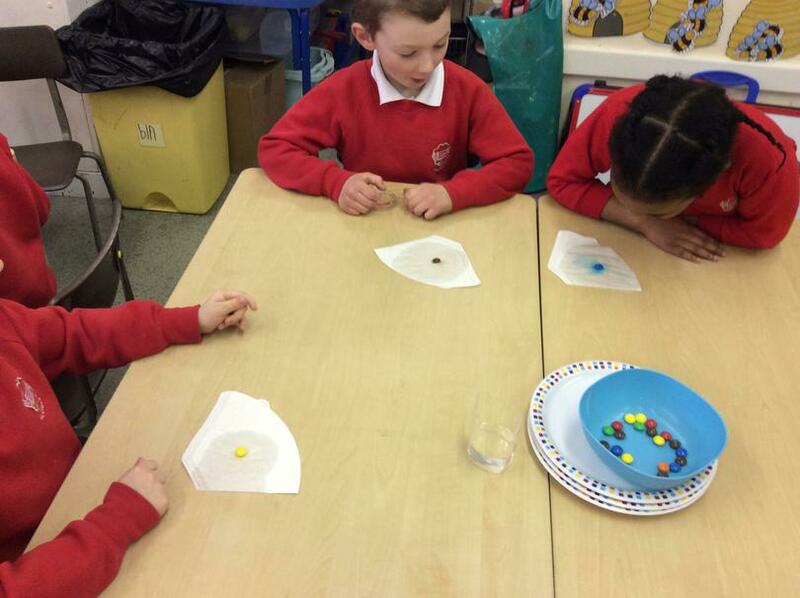 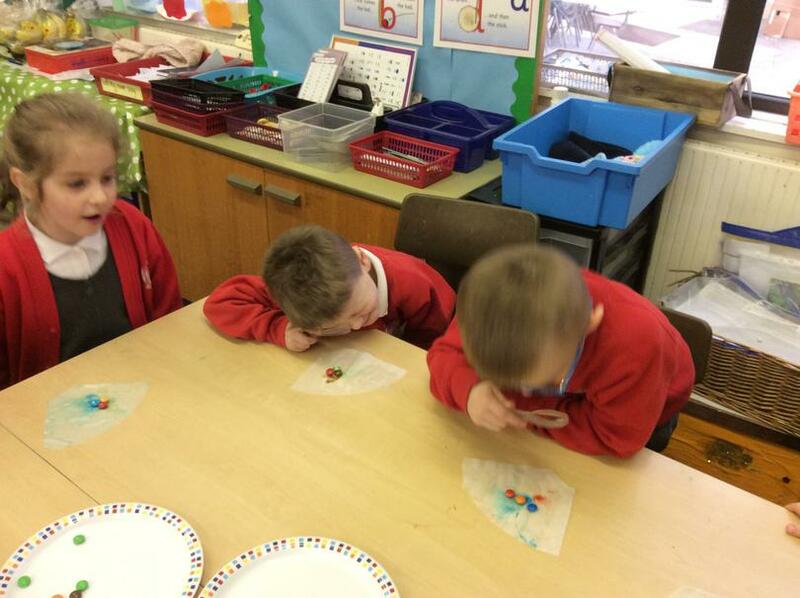 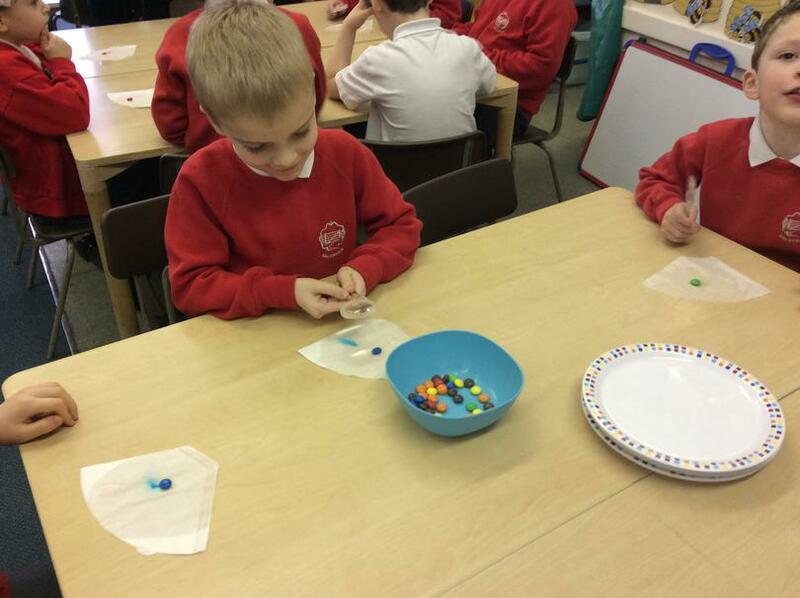 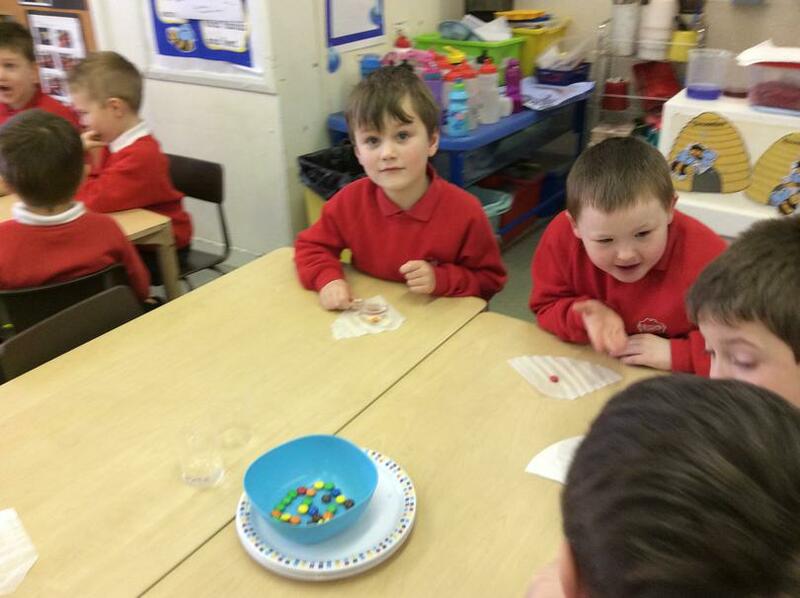 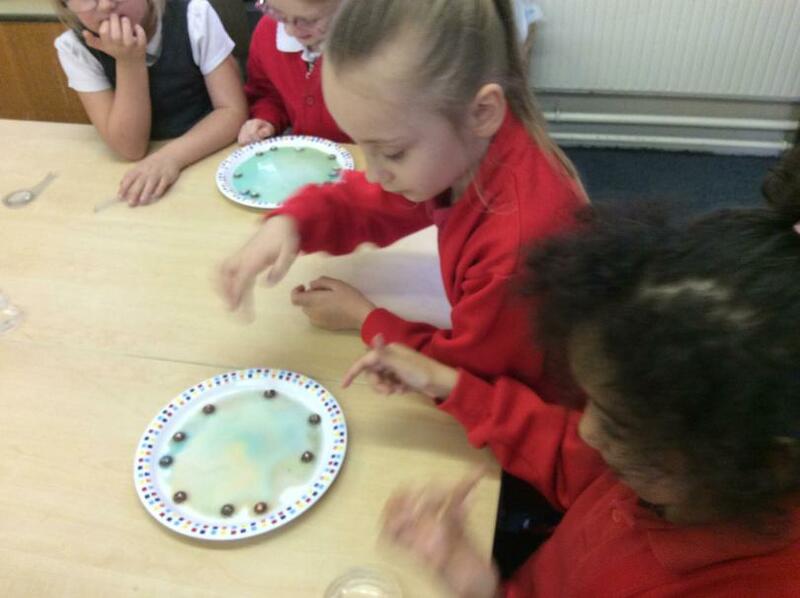 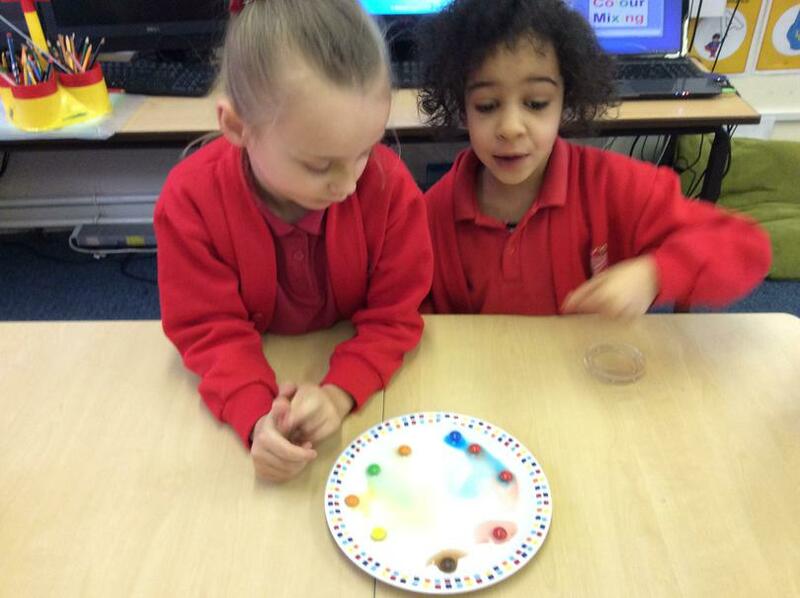 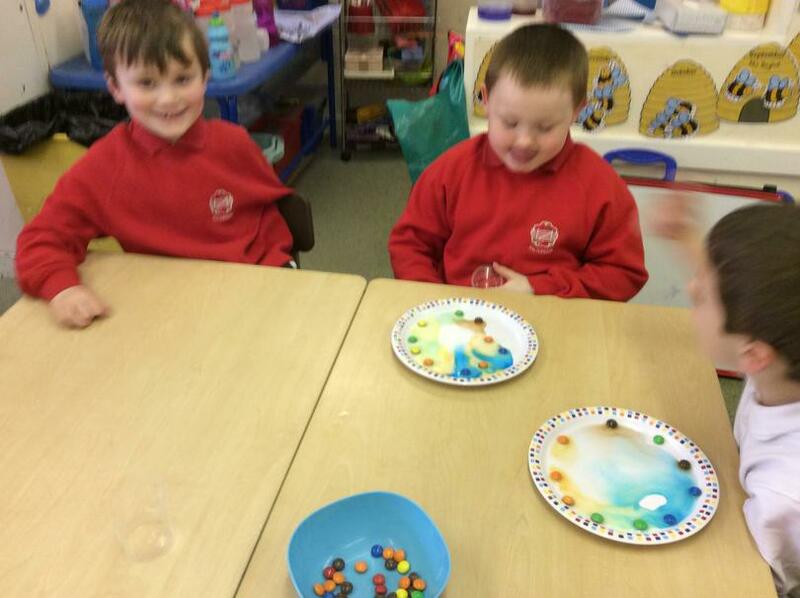 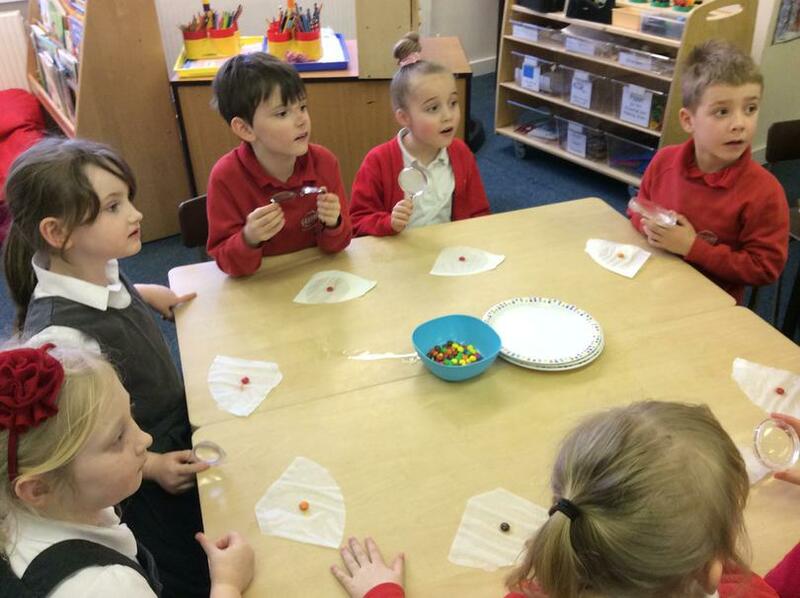 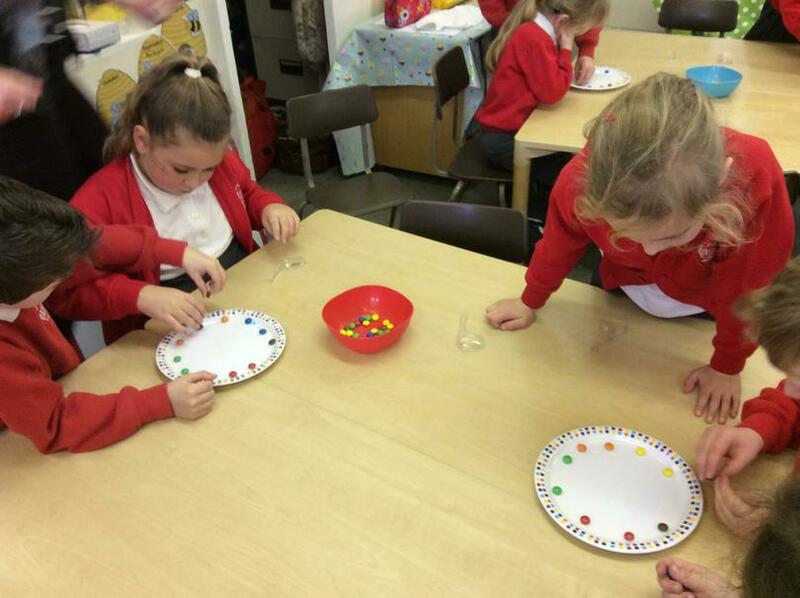 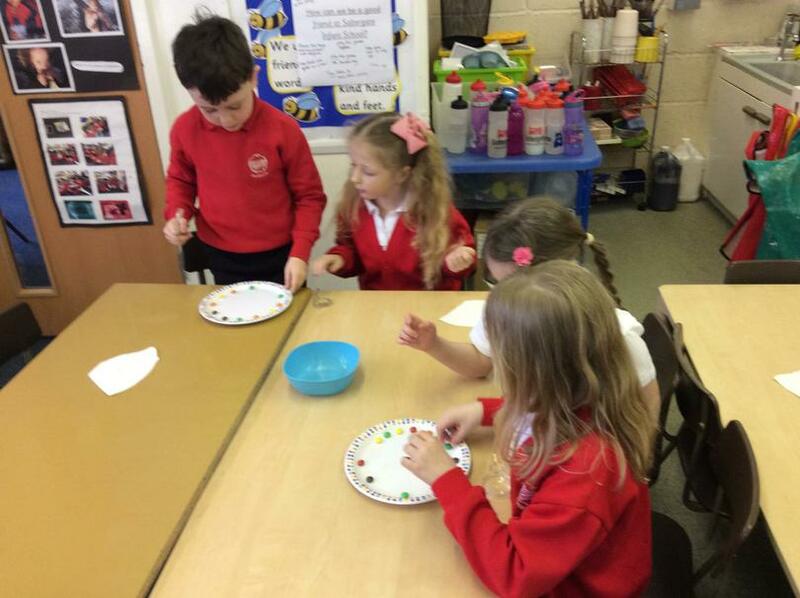 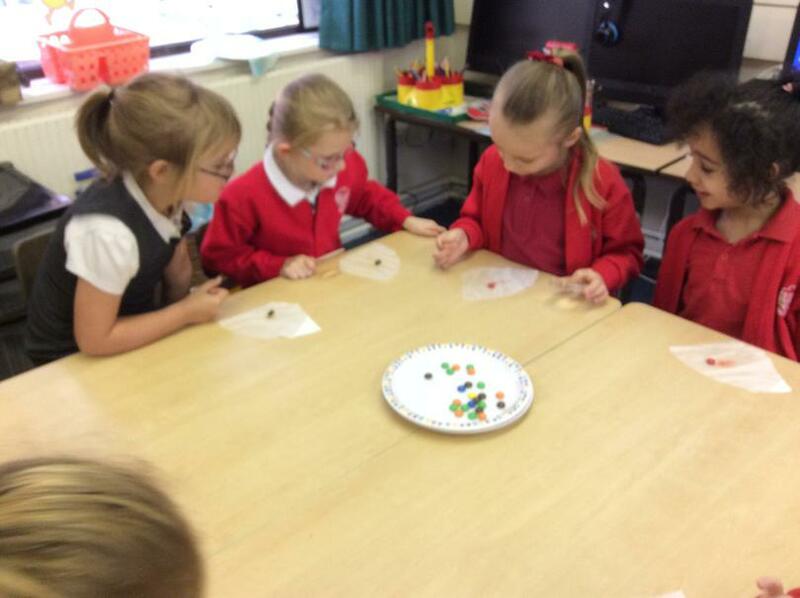 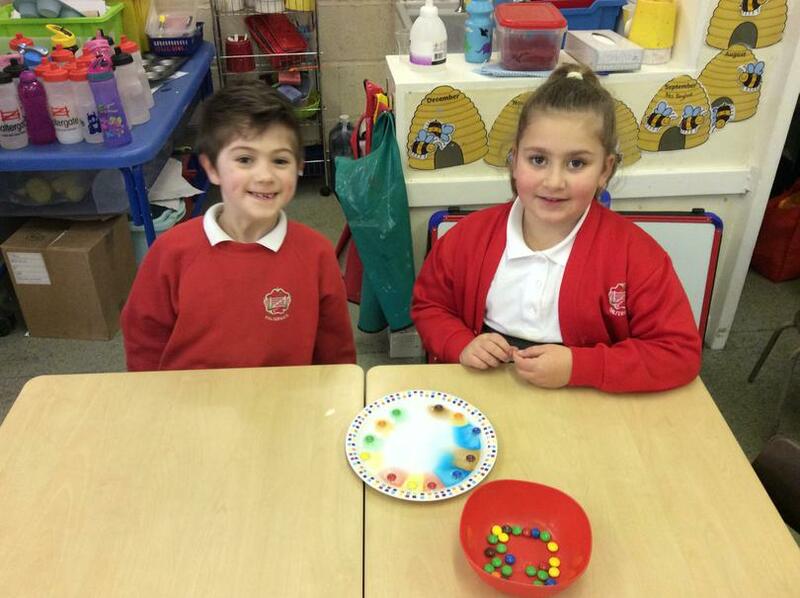 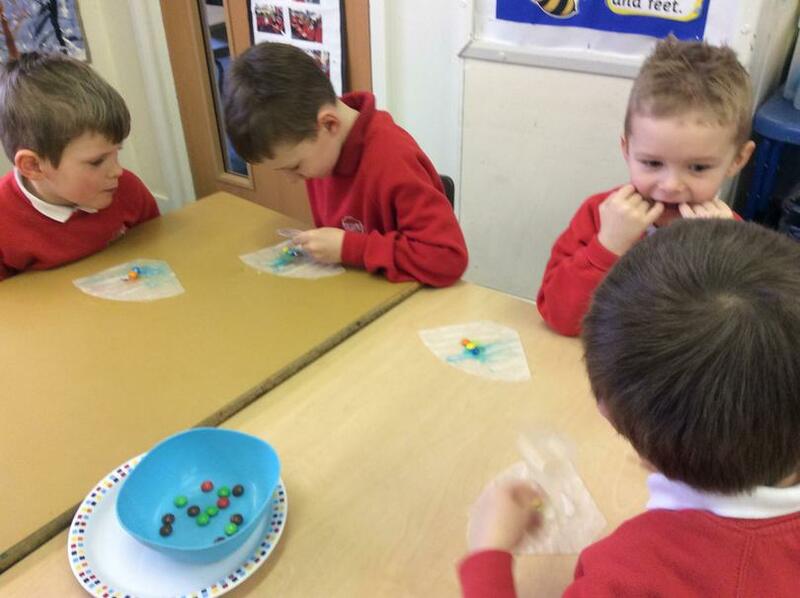 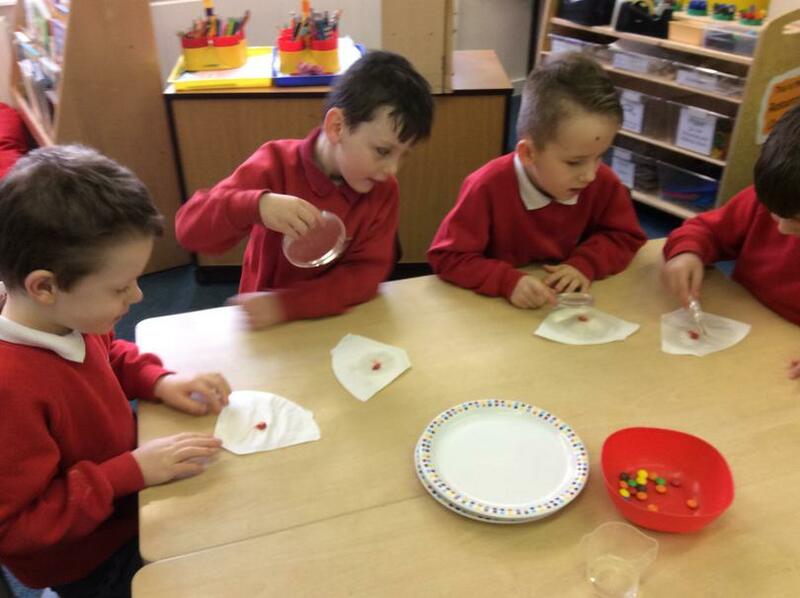 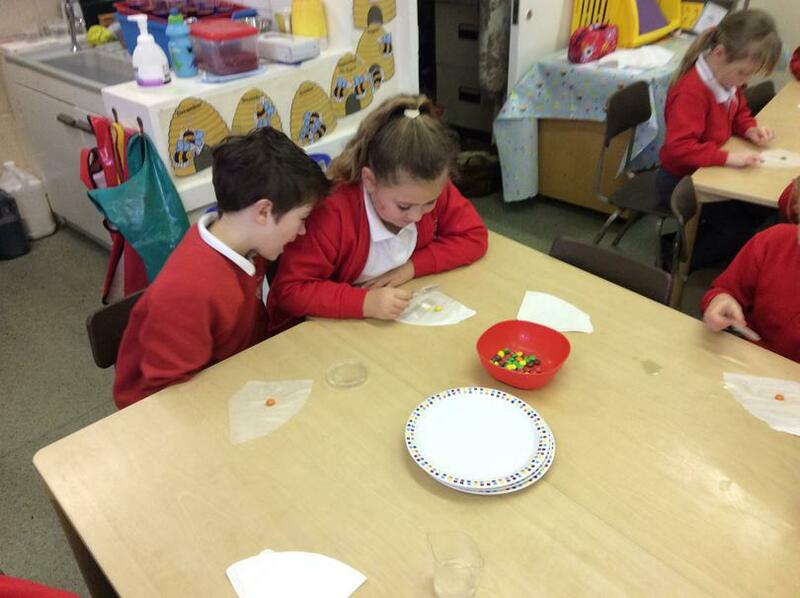 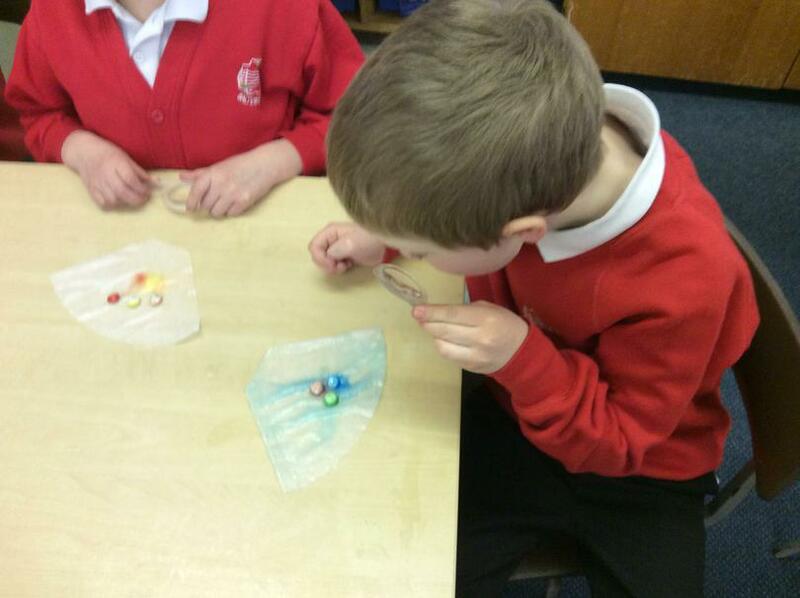 Observing colours which come from chocolate M&M's was so exciting, look how the colours spread and mix together. 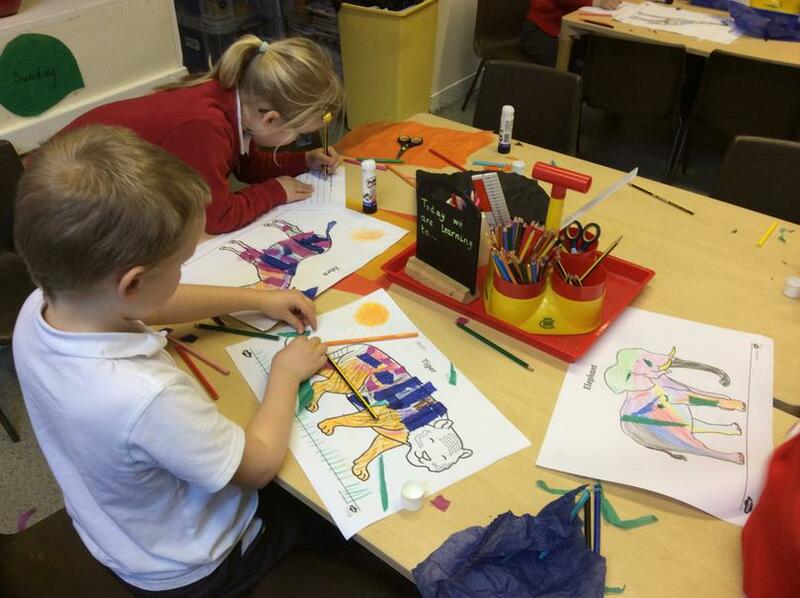 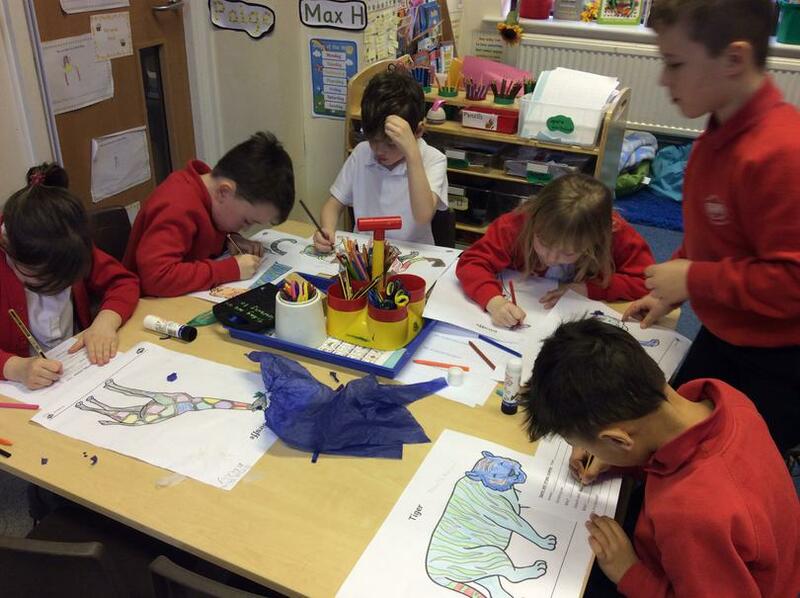 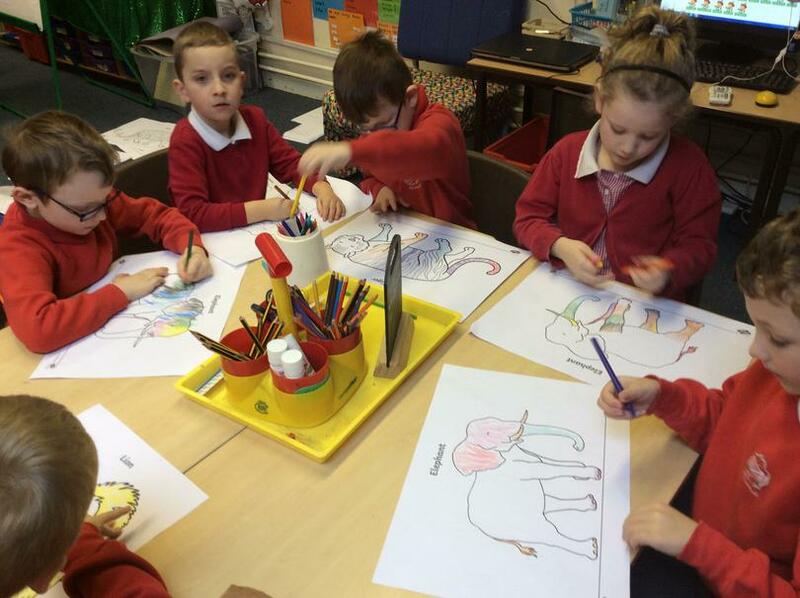 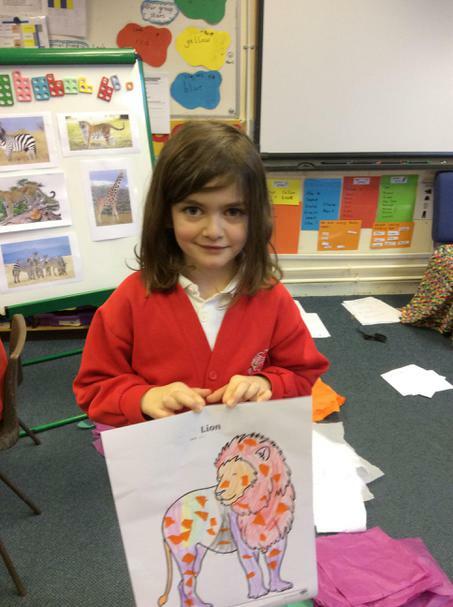 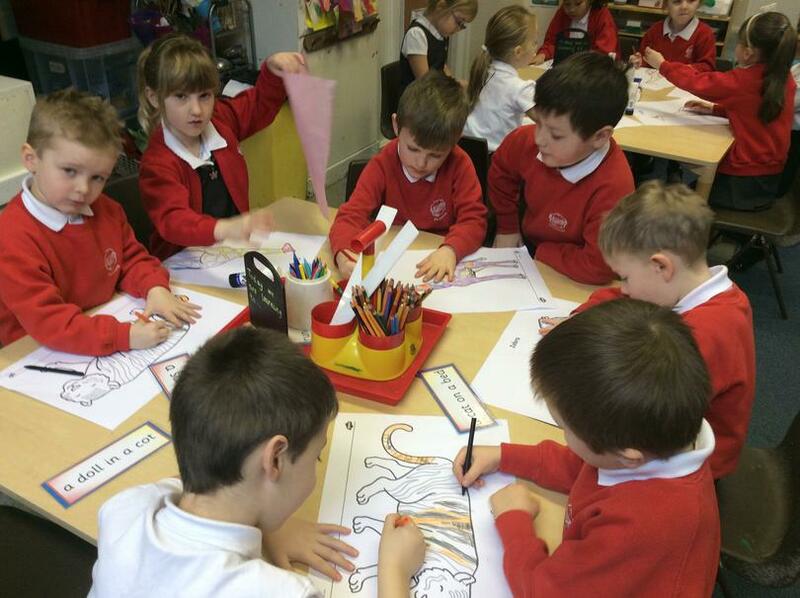 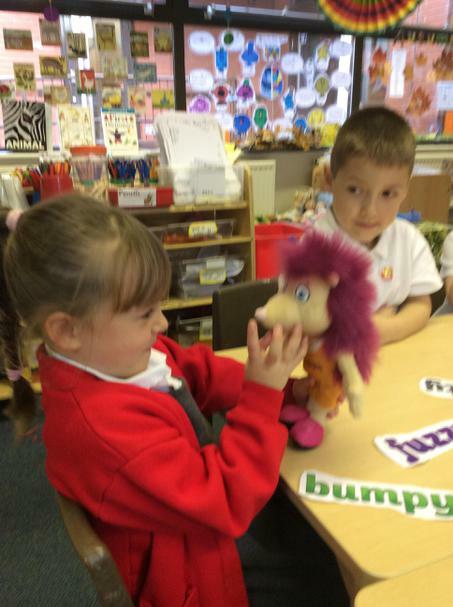 The children raised questions about why animals have spots and stripes. 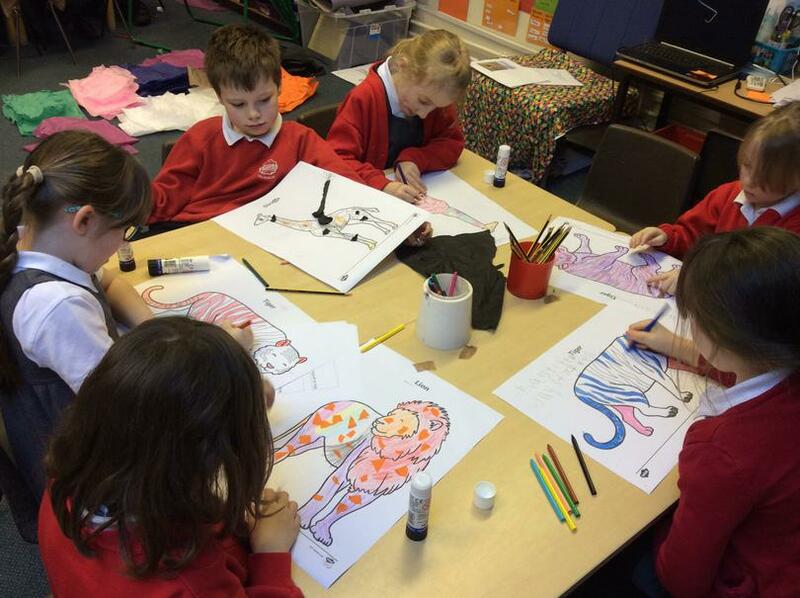 They went on to design and make their own unique animals using spots and stripes. 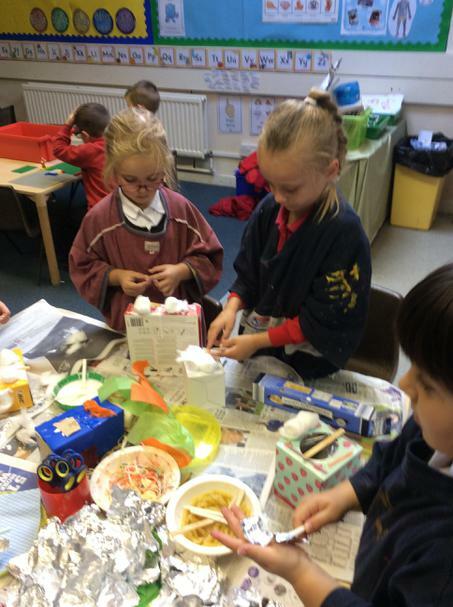 This work was continued in The Outdoor Learning Area. 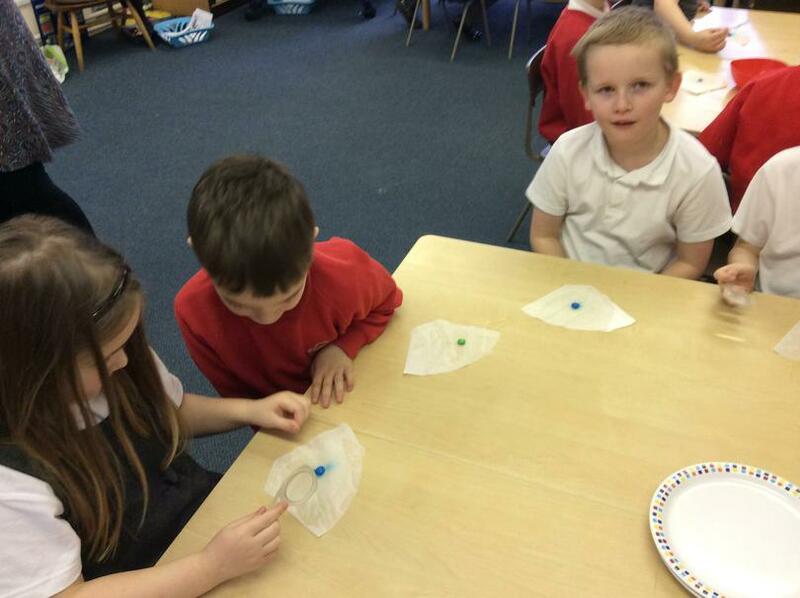 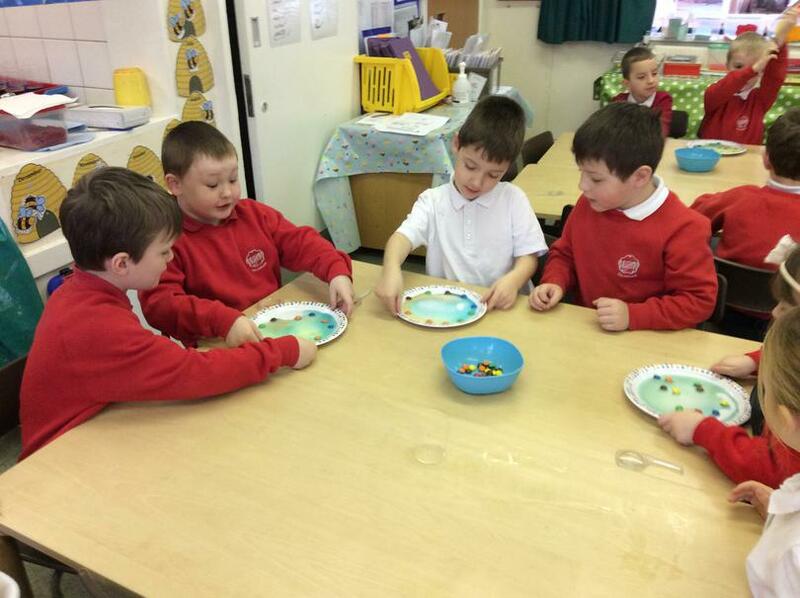 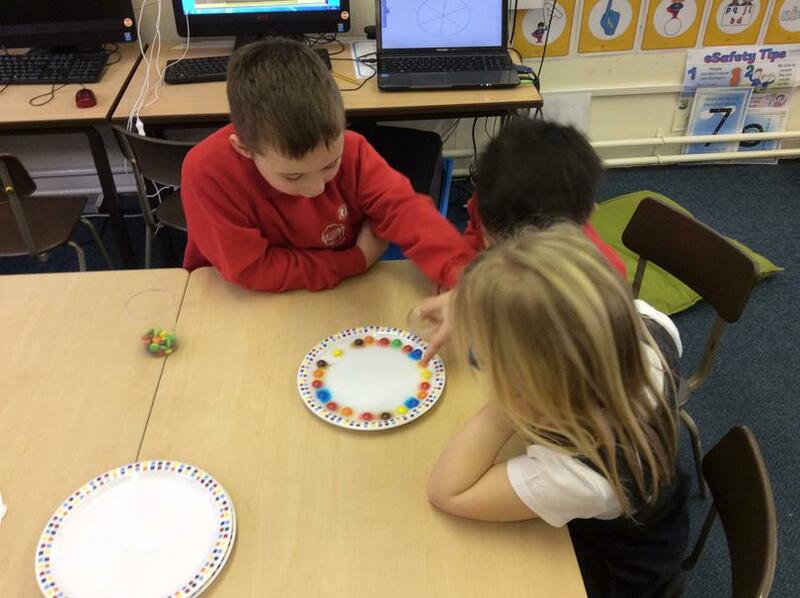 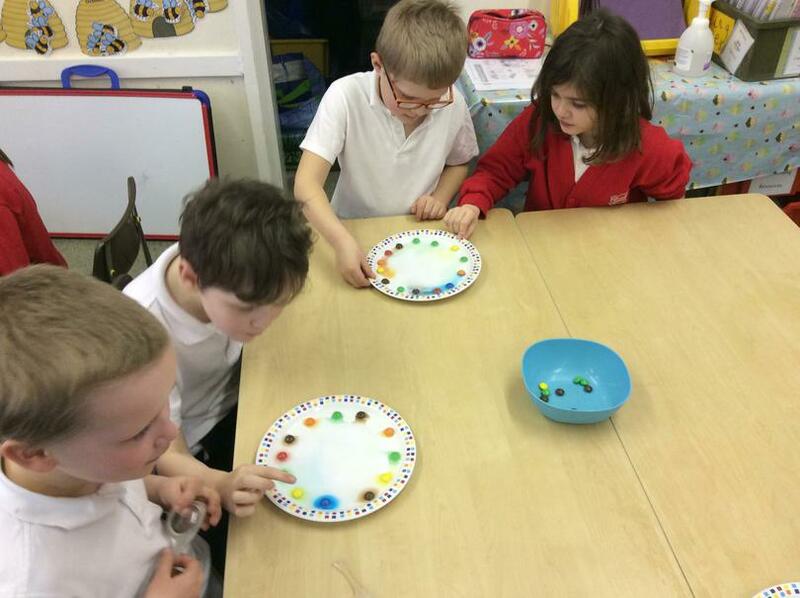 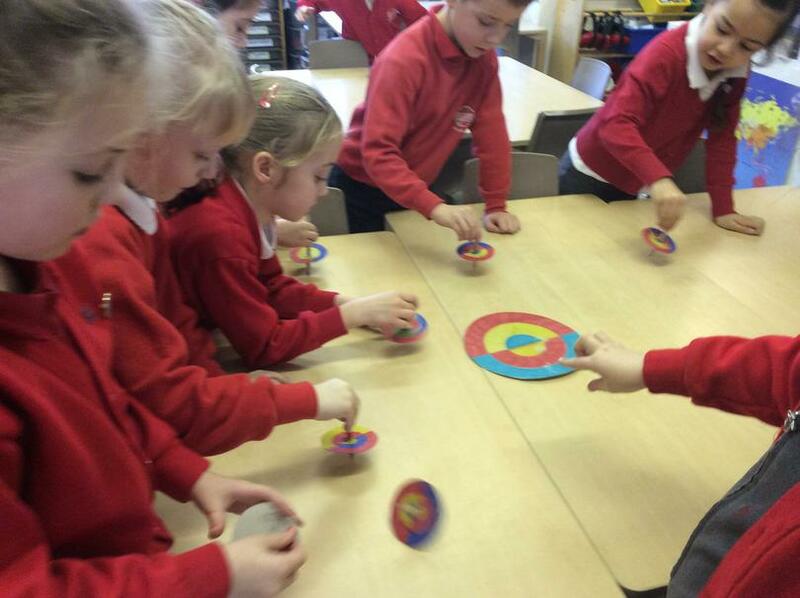 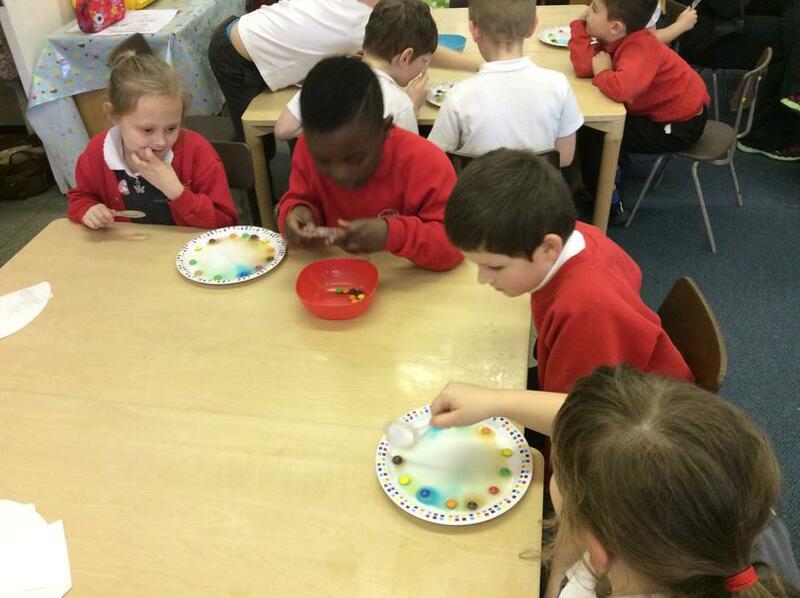 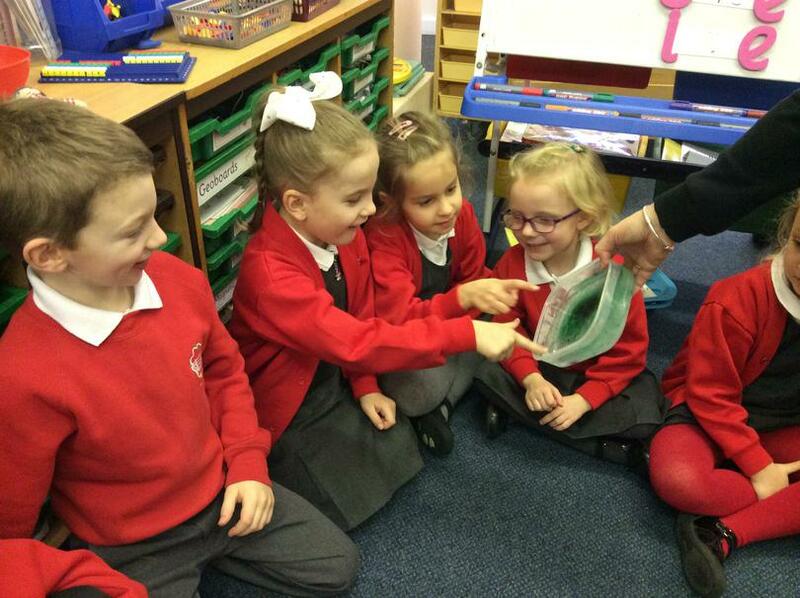 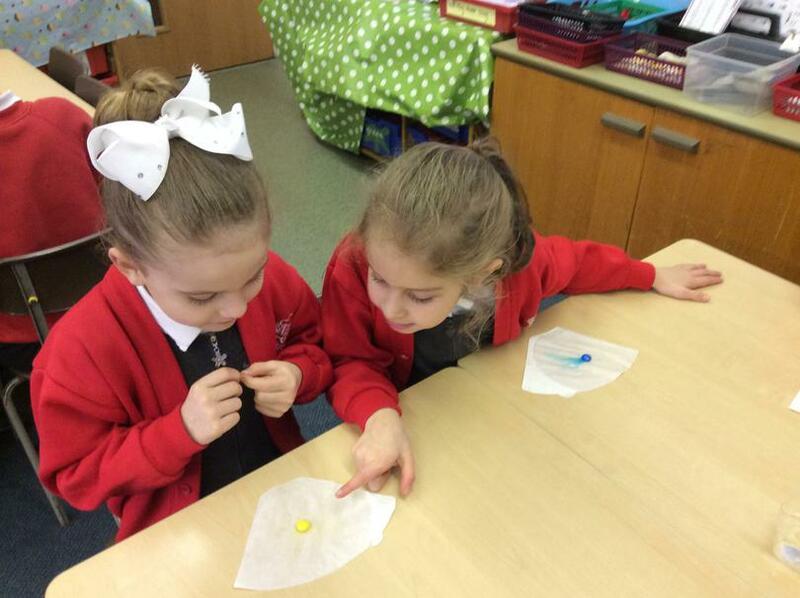 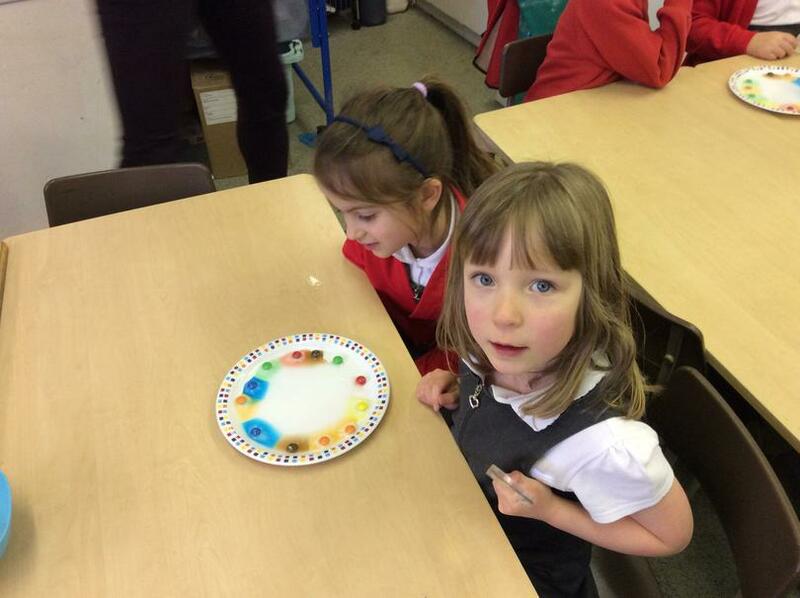 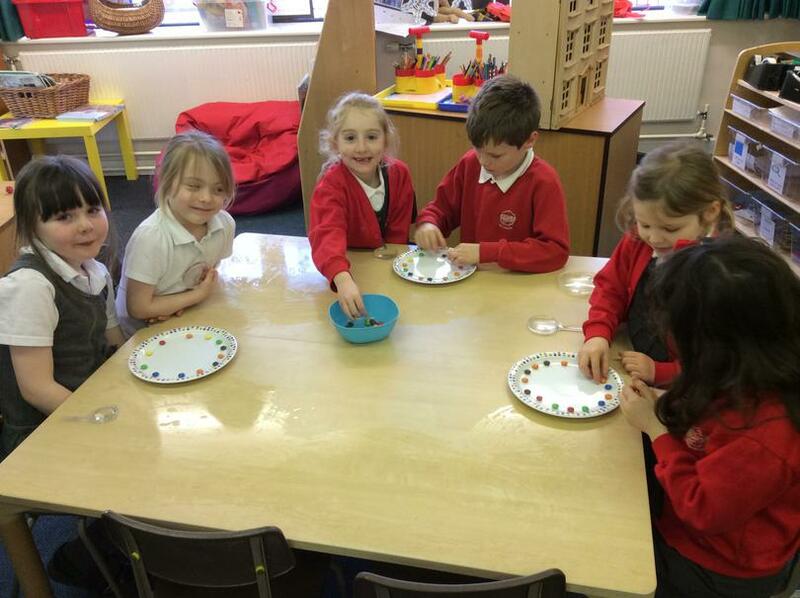 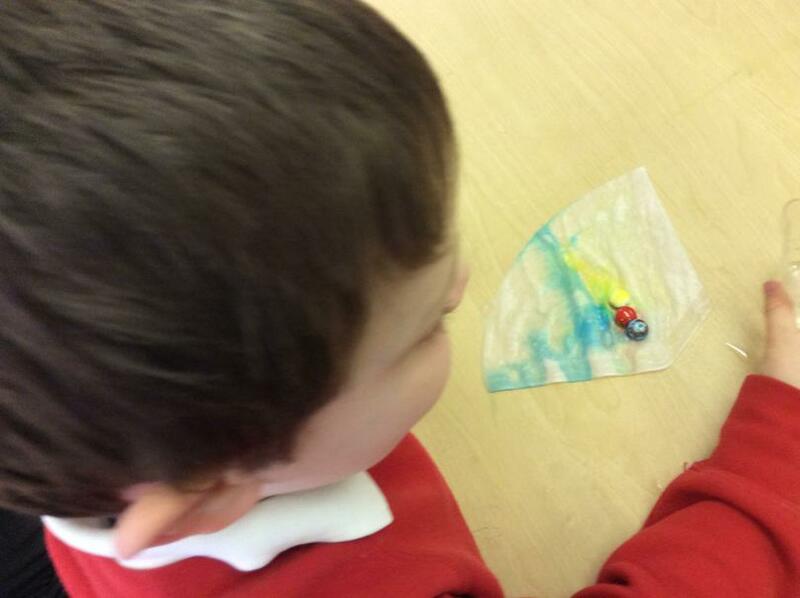 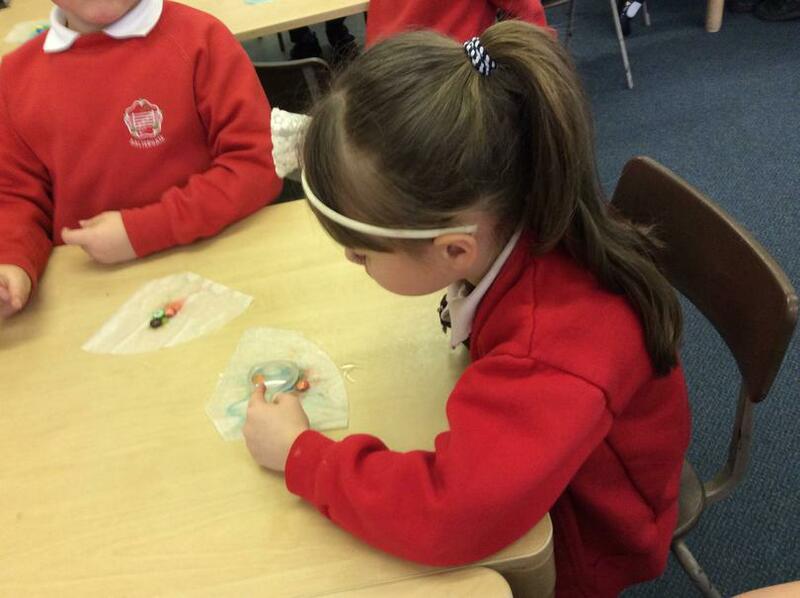 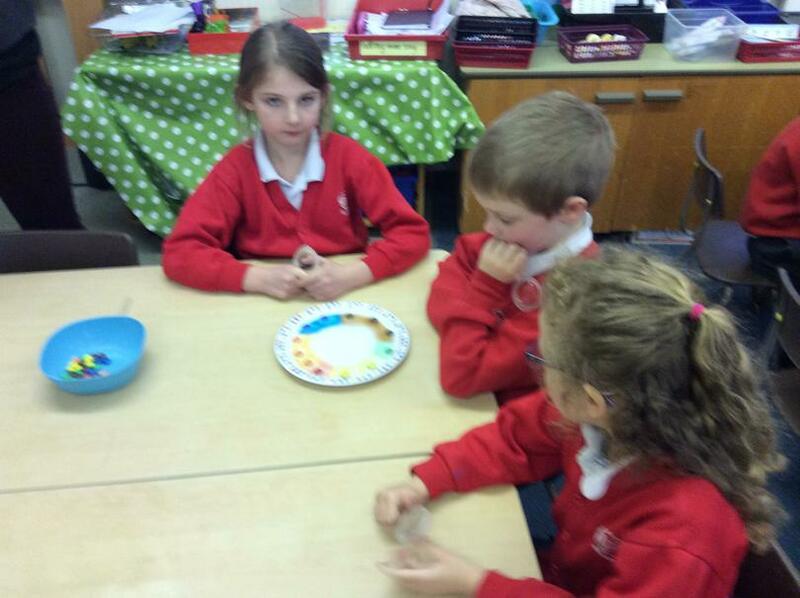 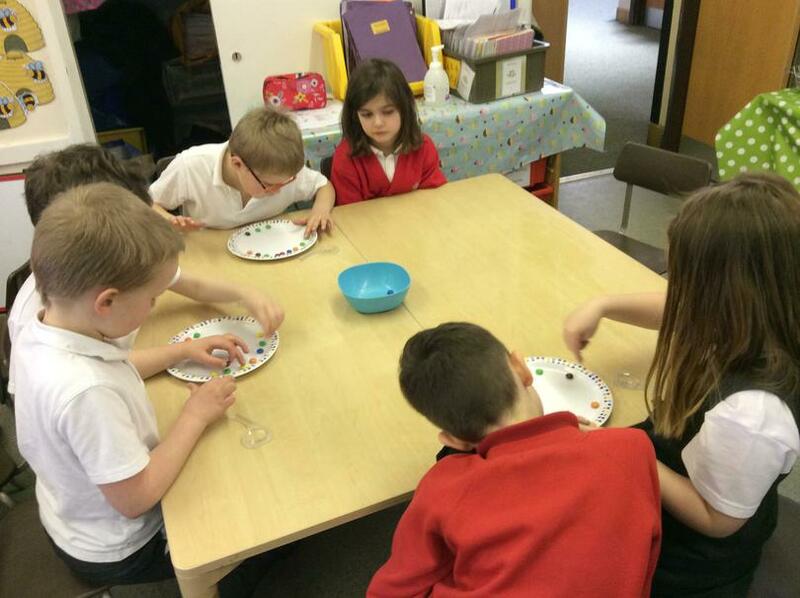 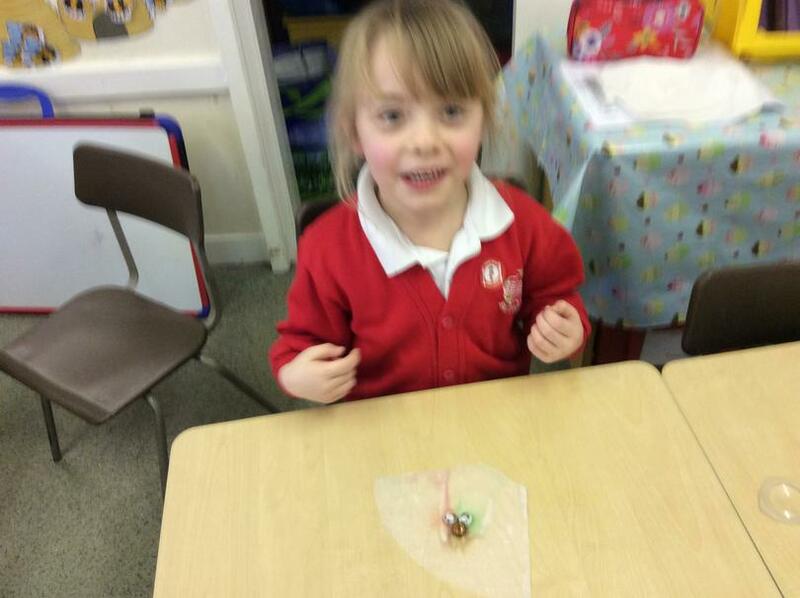 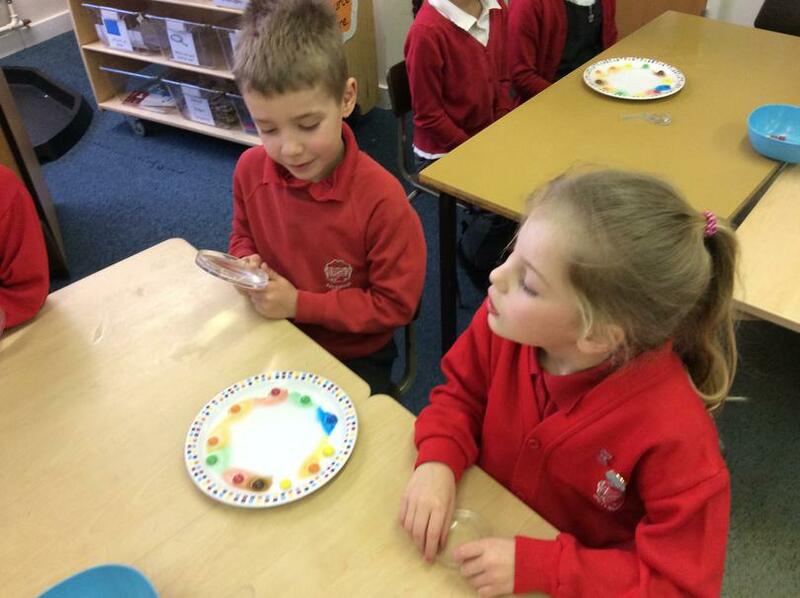 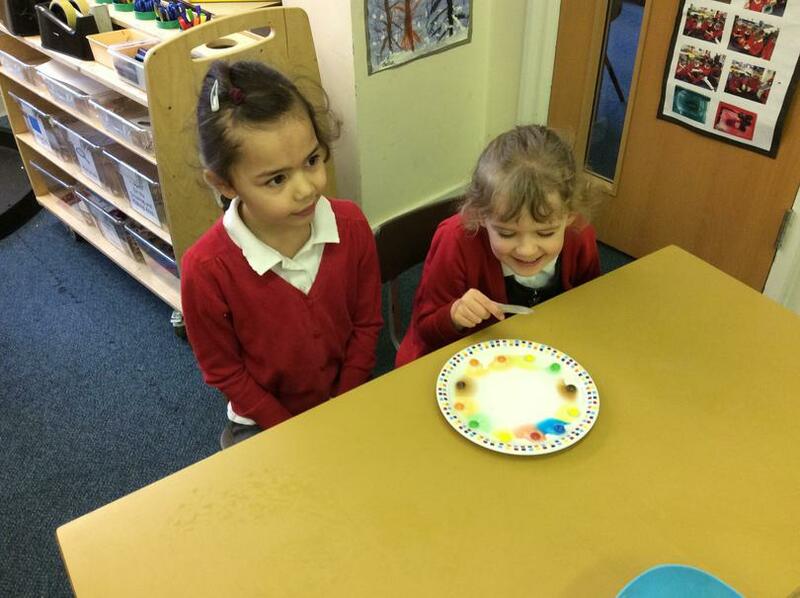 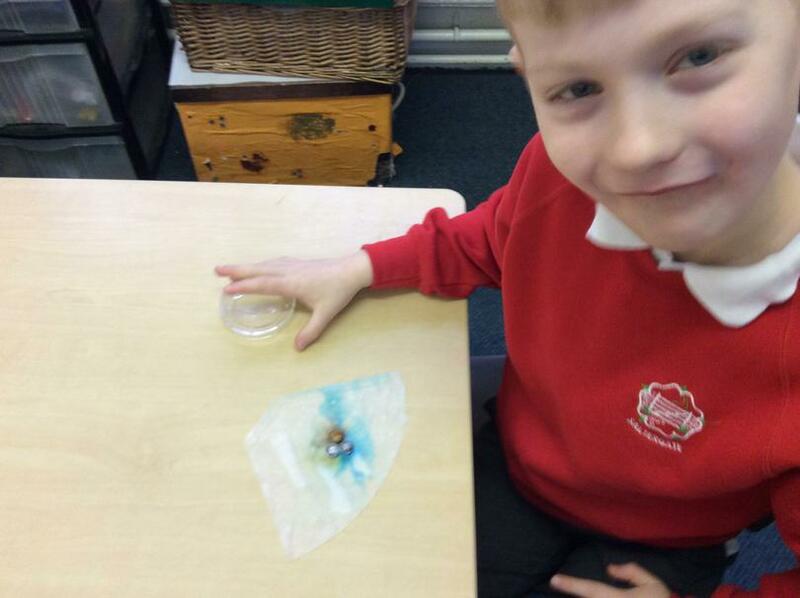 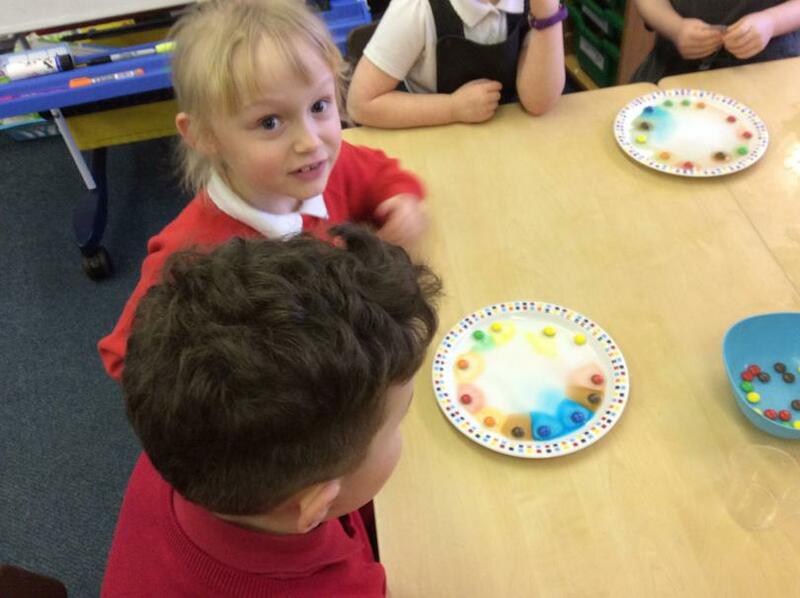 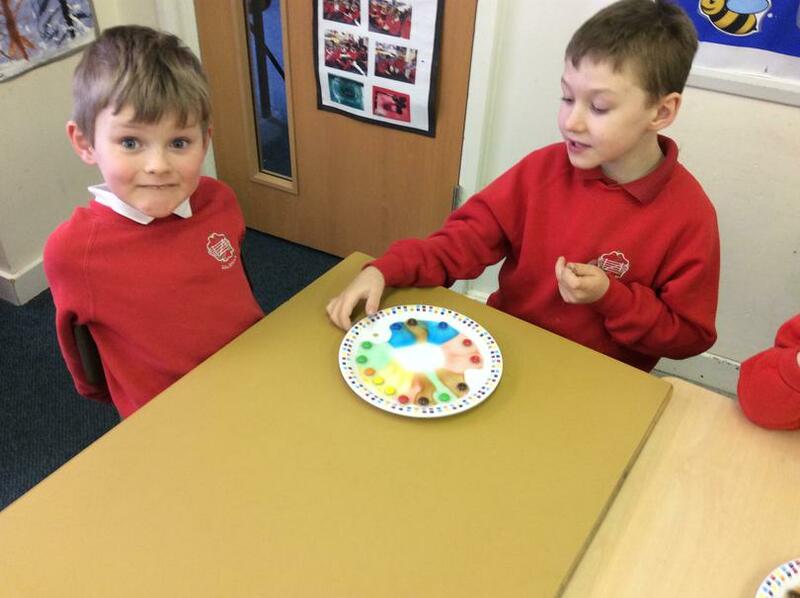 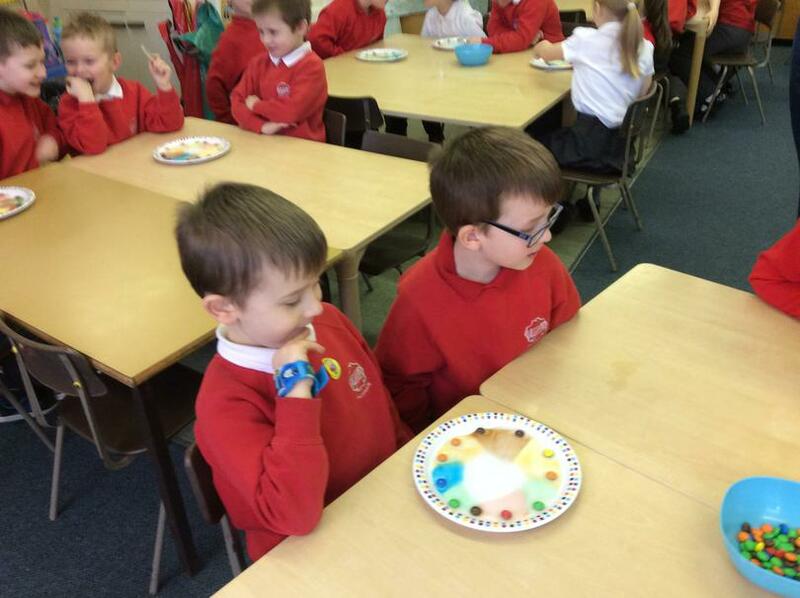 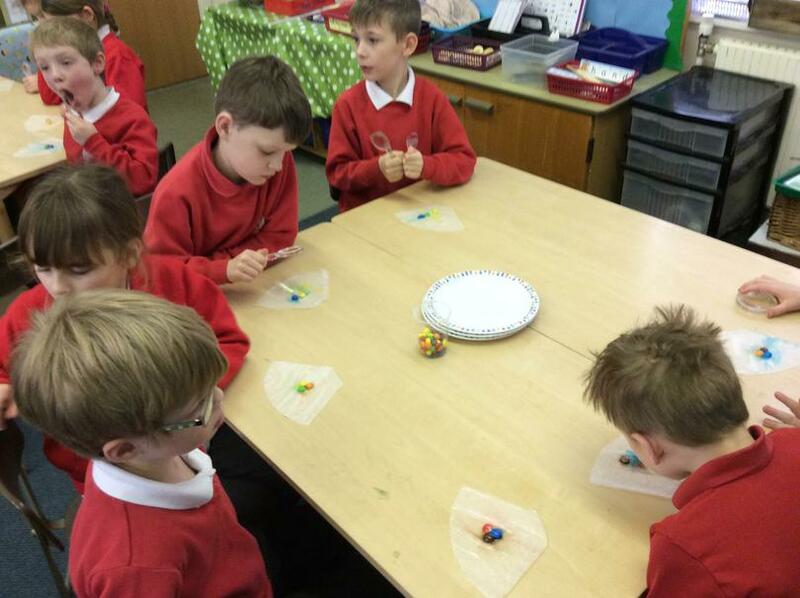 The children investigated what happens to colours when they are spun on a spinning top. 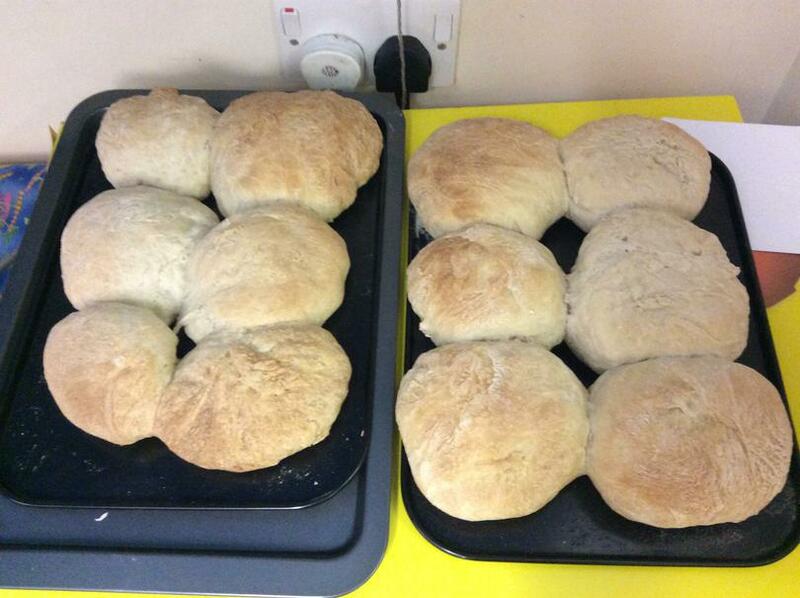 Check out some of our videos that show the results. 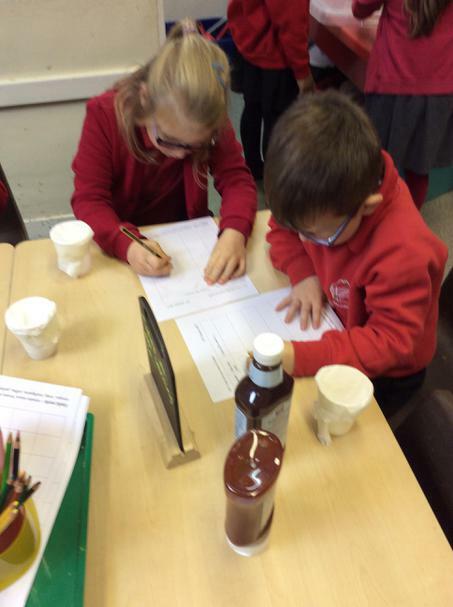 During the Science day the children also researched the famous Scientist Sir Isaac Newton. 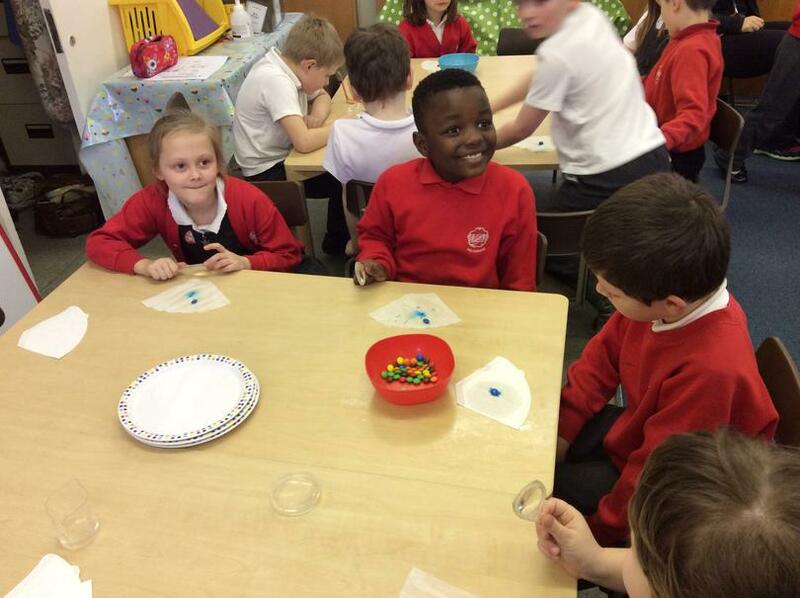 They not only discovered facts about his life but also learned a song describing his discoveries as a Scientist. 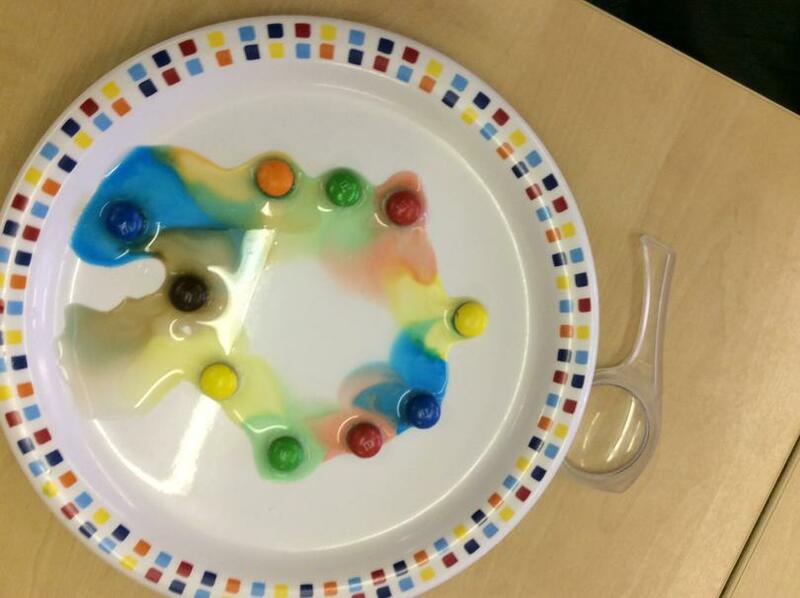 Check out the videos below in the Video Resource Centre. 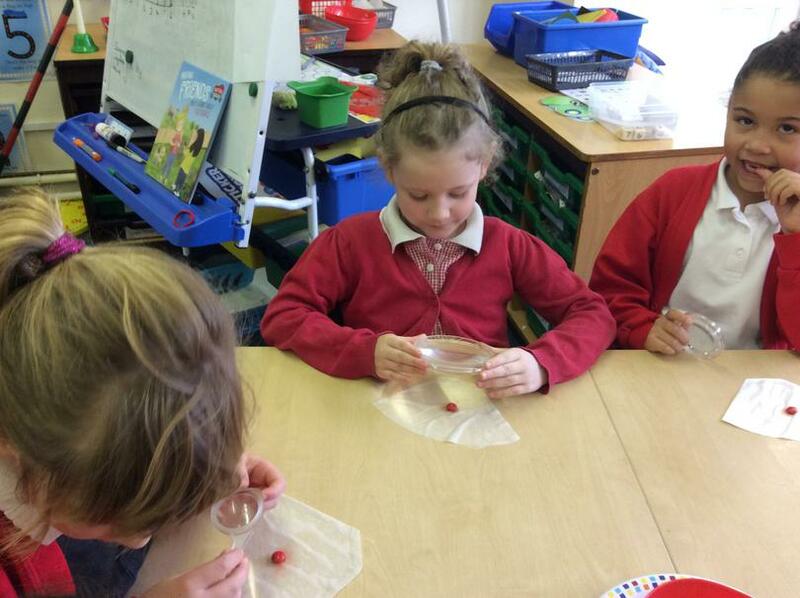 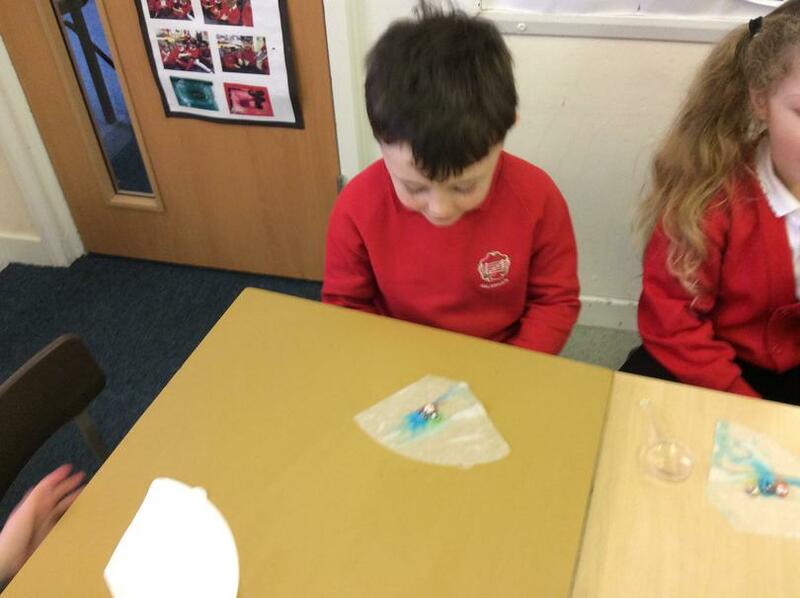 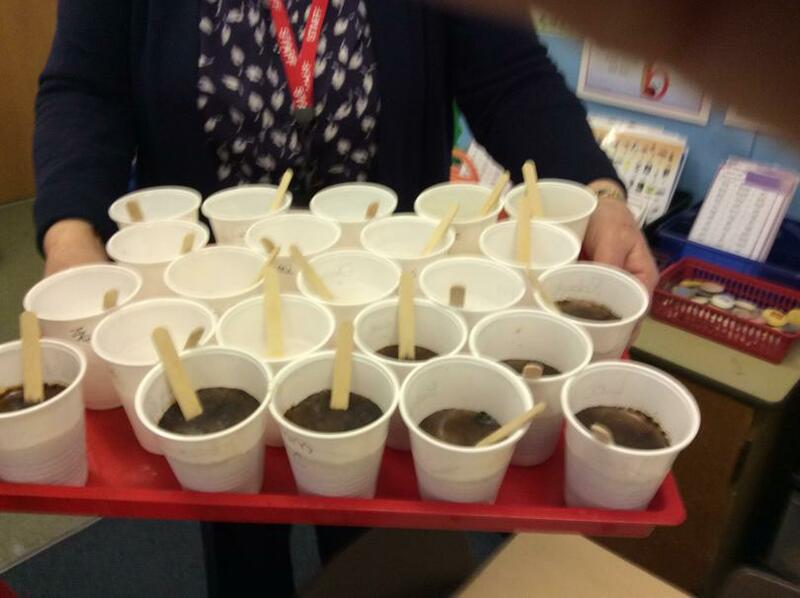 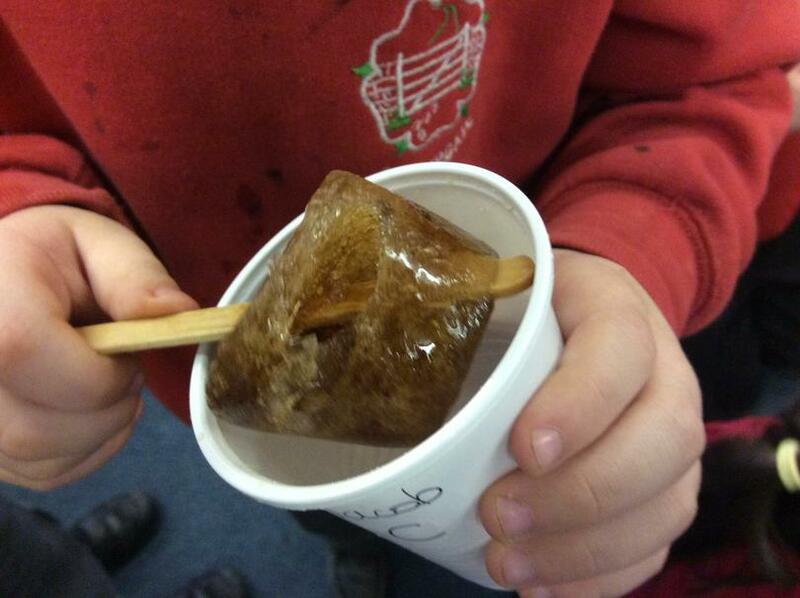 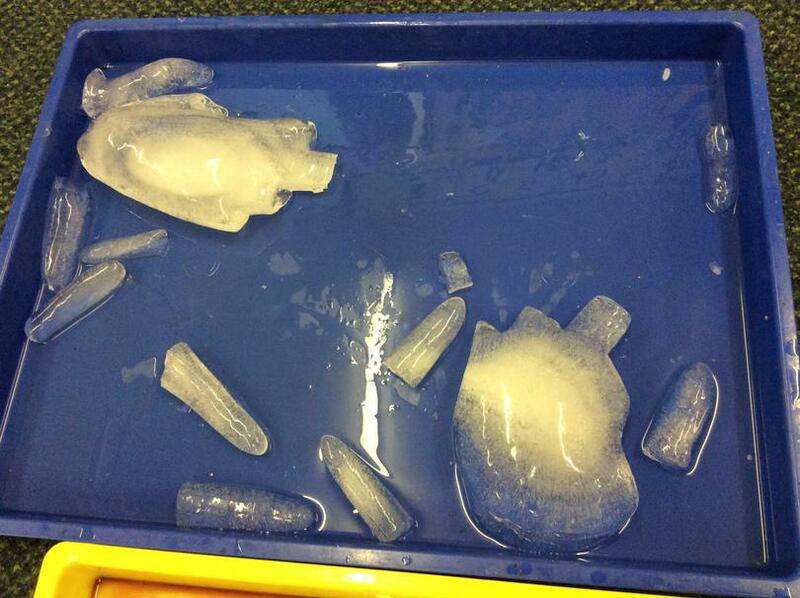 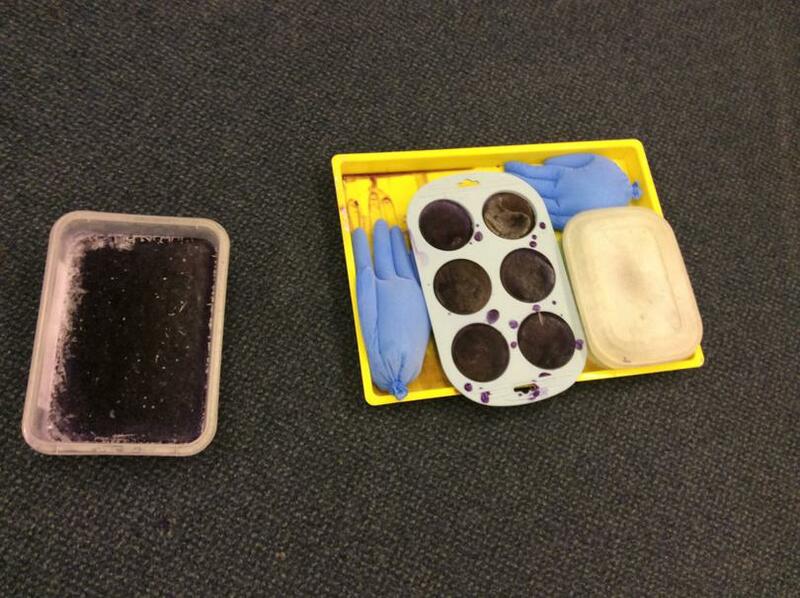 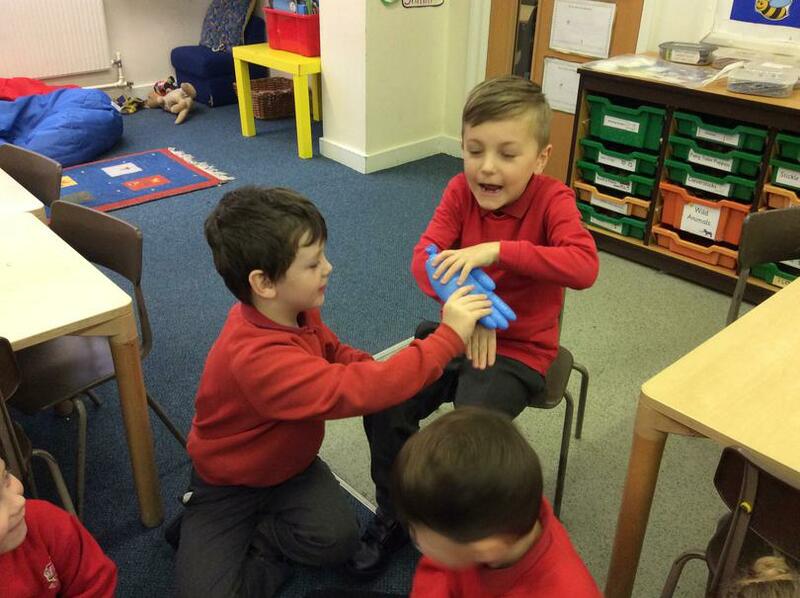 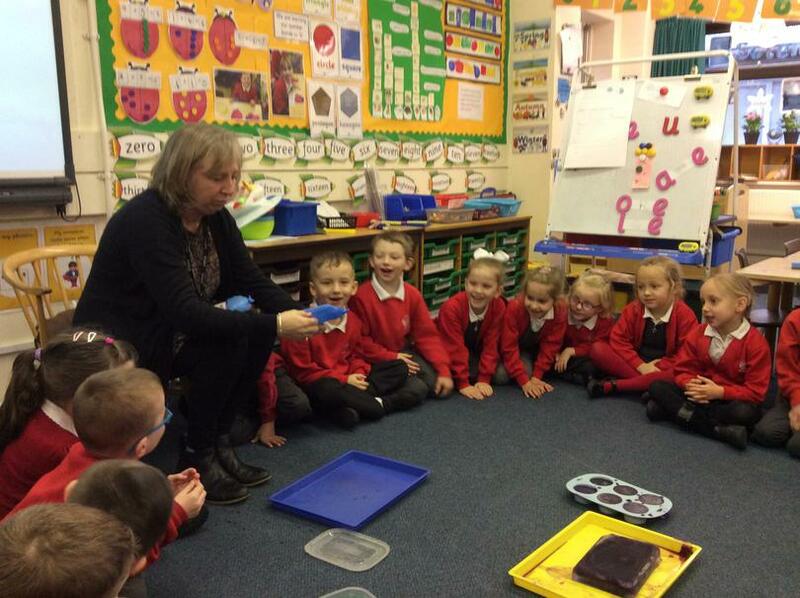 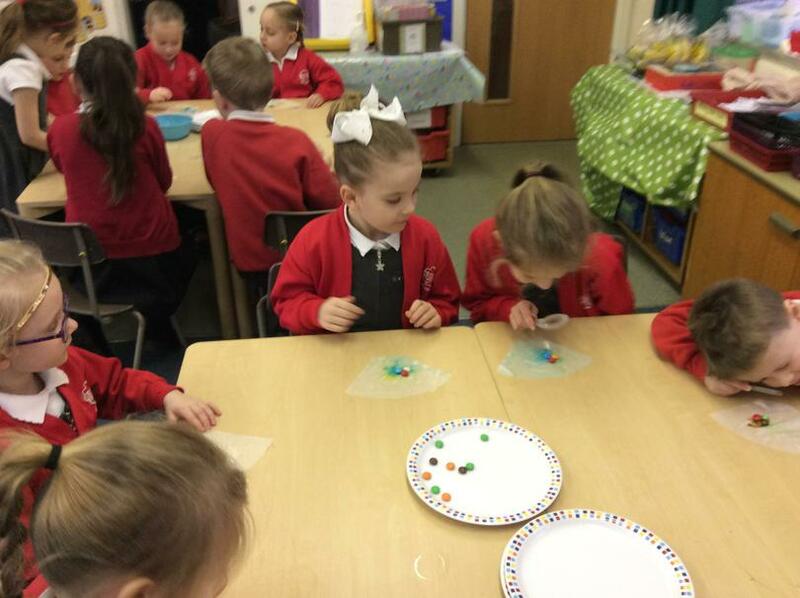 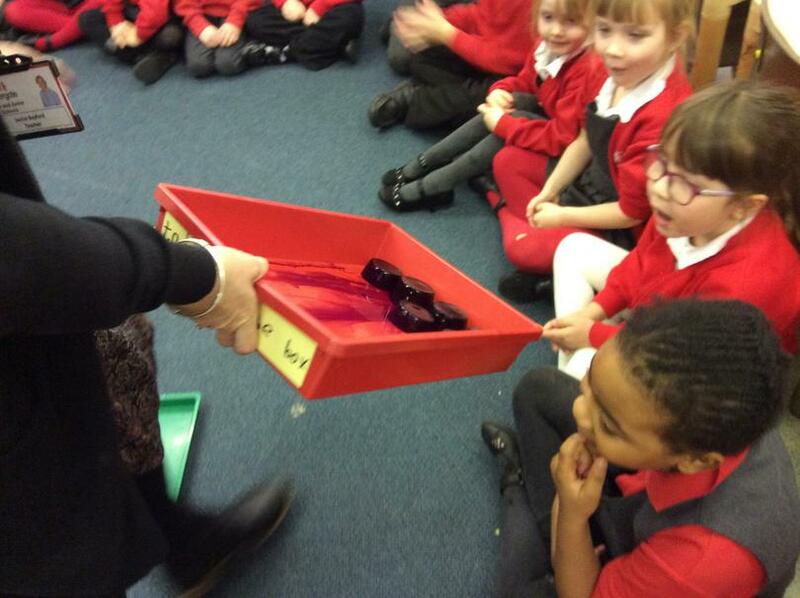 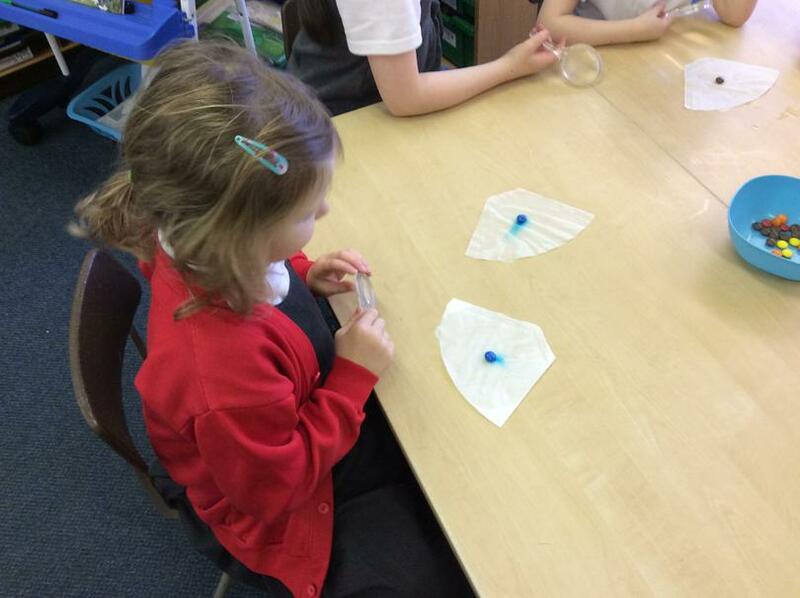 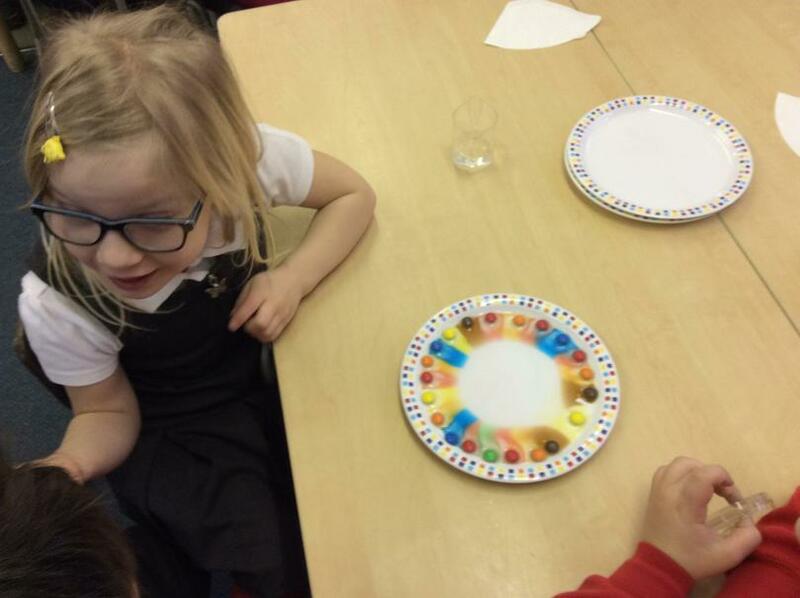 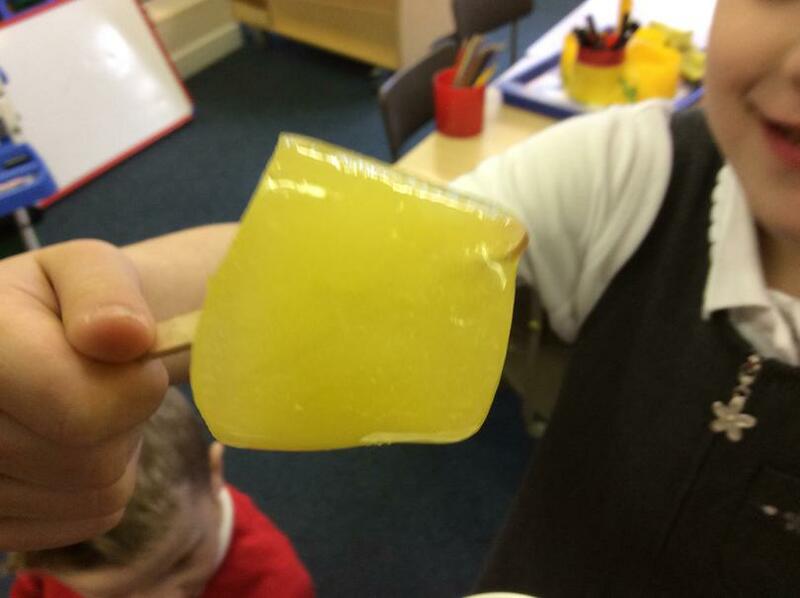 In year one we have been learning about Materials, so far we have done a few experiments with Ice. 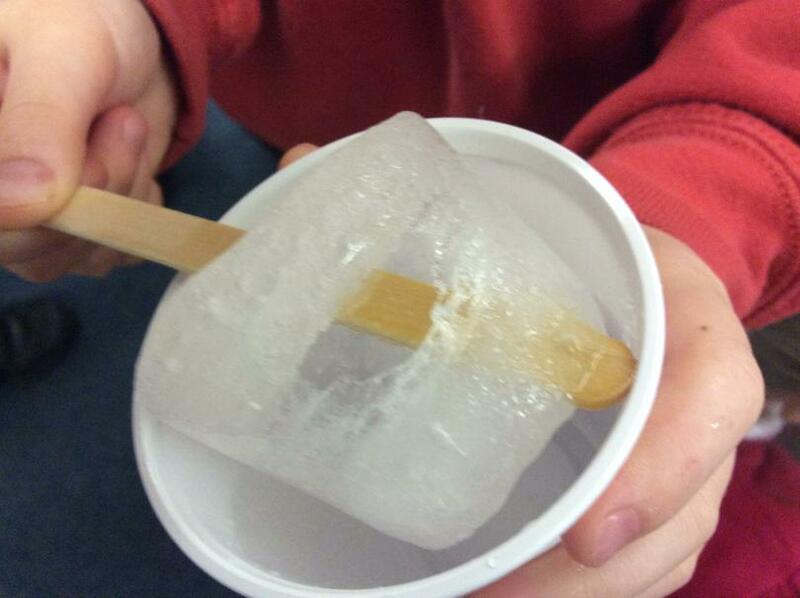 We put several different types of liquid into the freezer and then timed it to see how long it would take to defrost and return back to liquid again. 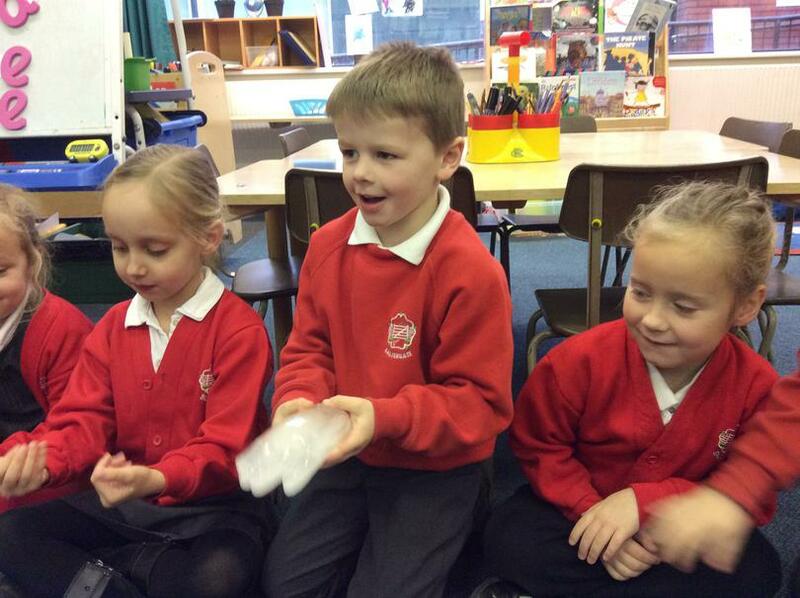 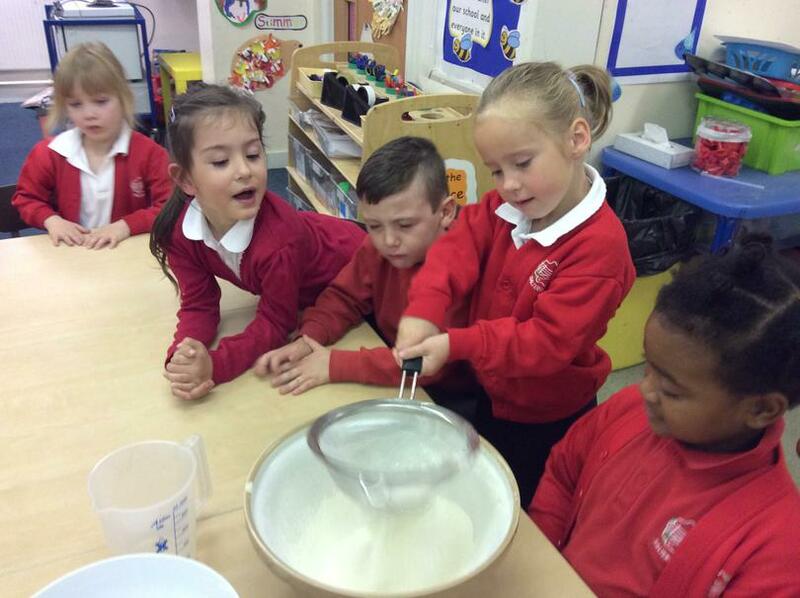 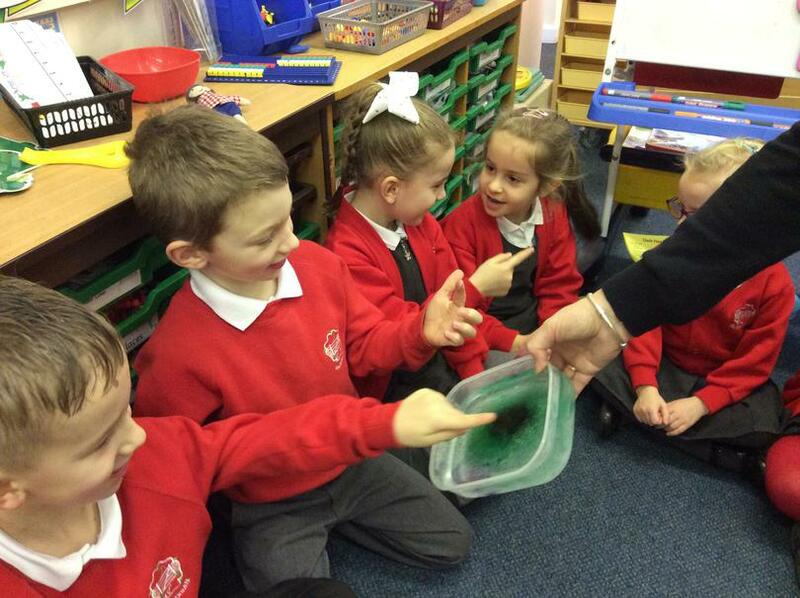 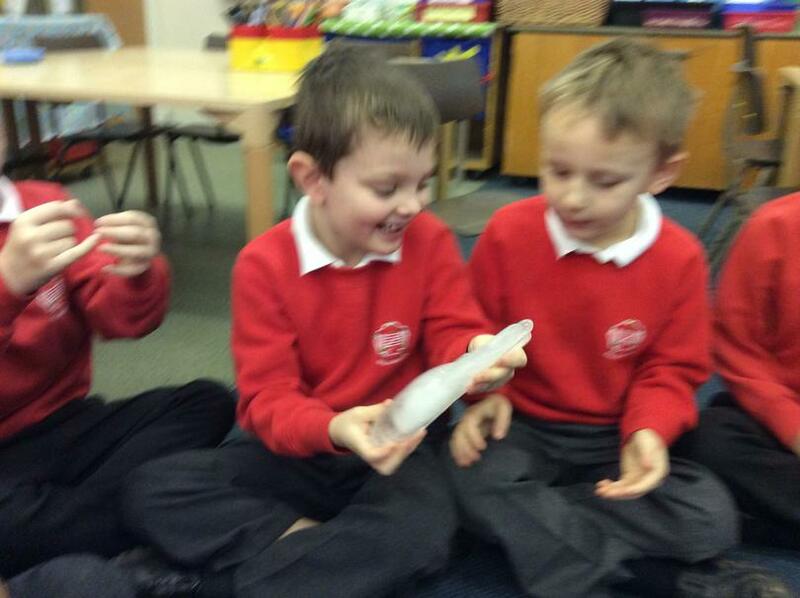 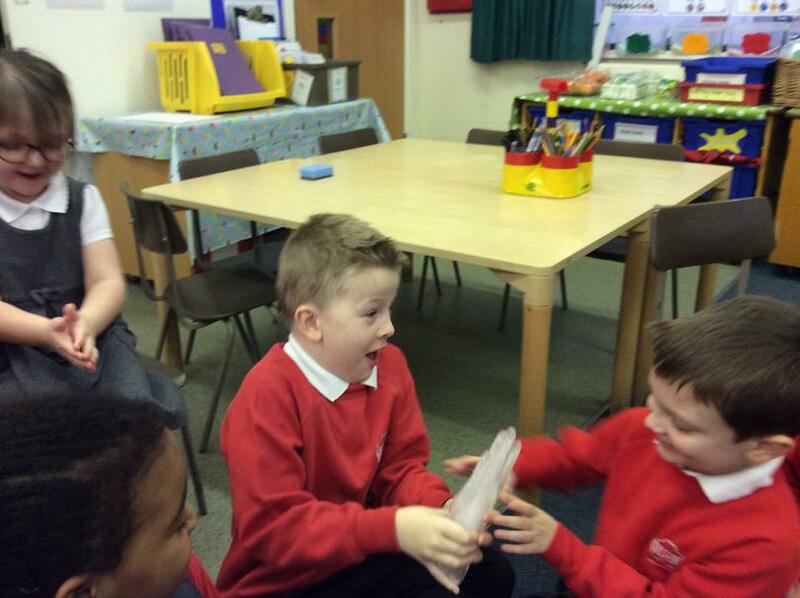 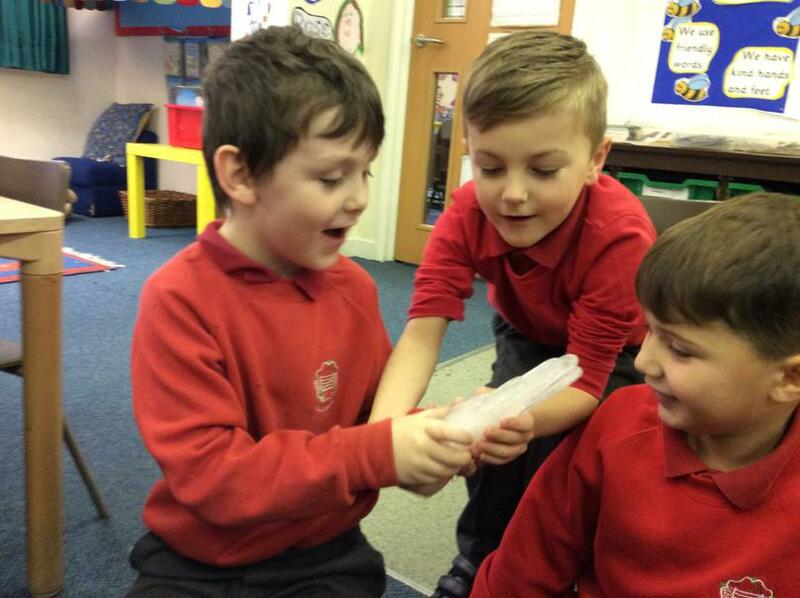 We also used our hands to explore how the liquid felt before freezing, once frozen and again after it had defrosted. 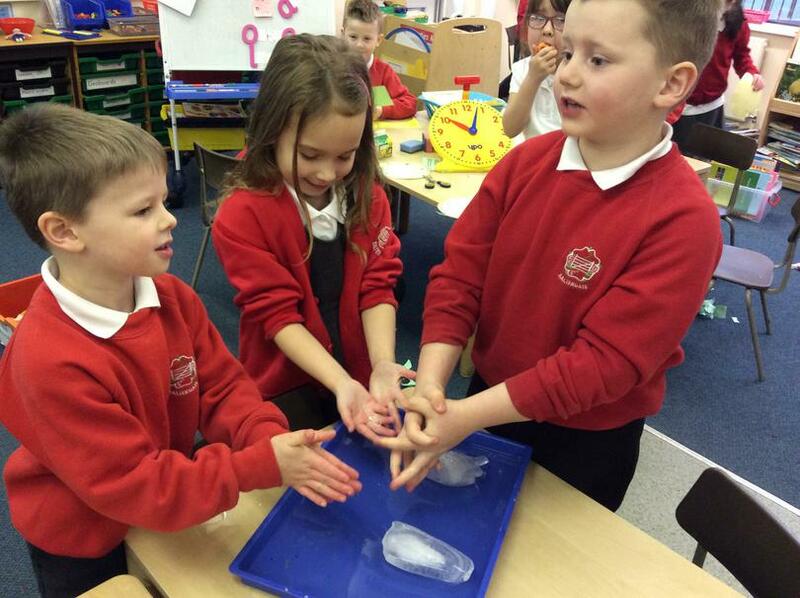 We had fun watching the Ice Hands melting. 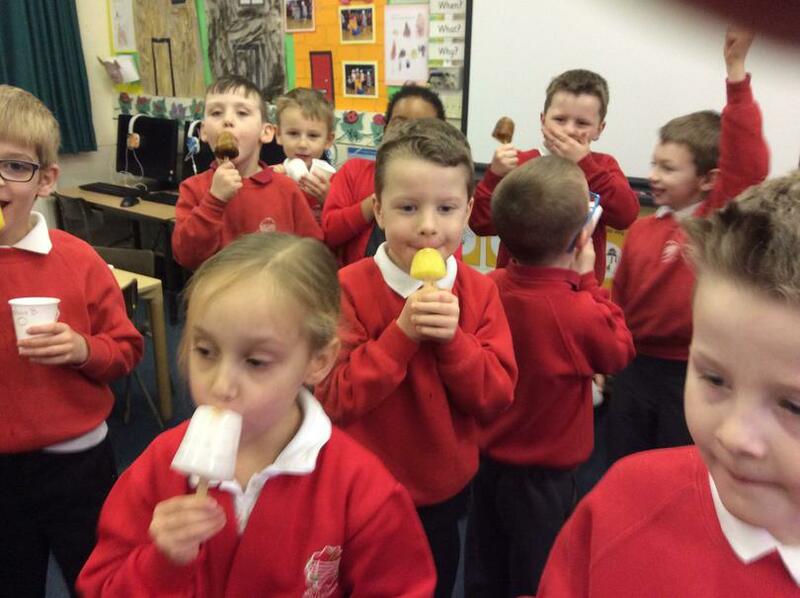 We even got to make and eat some different flavour Ice Lollies. 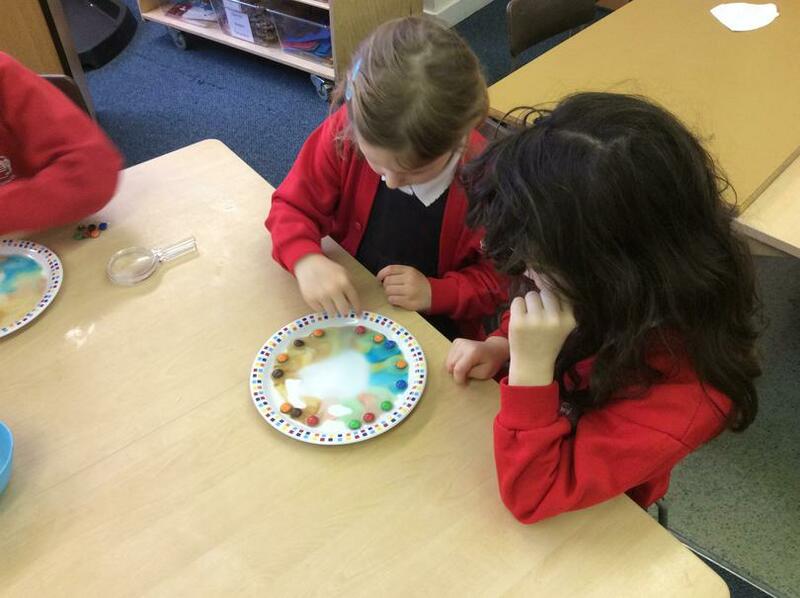 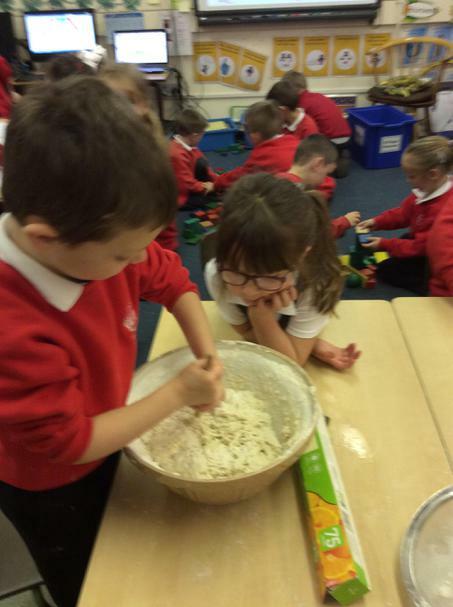 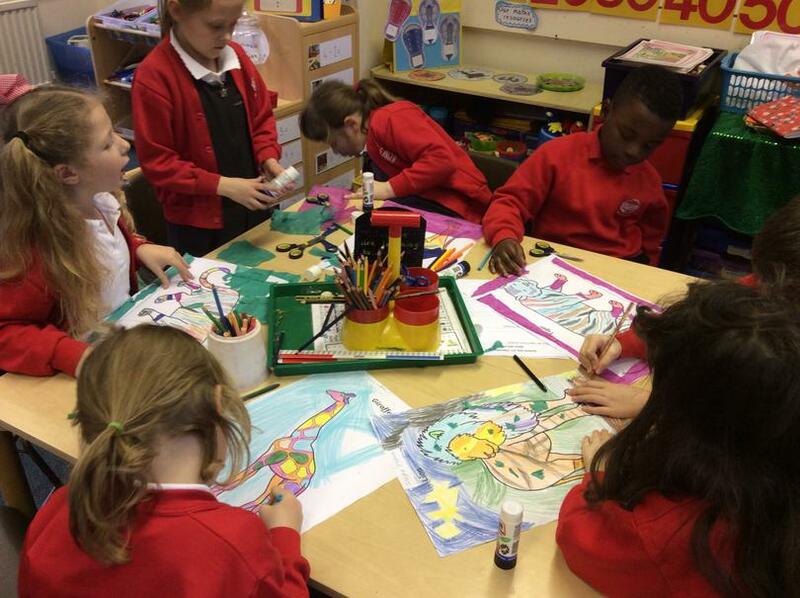 Check out some more of our pictures from our exciting Science work. 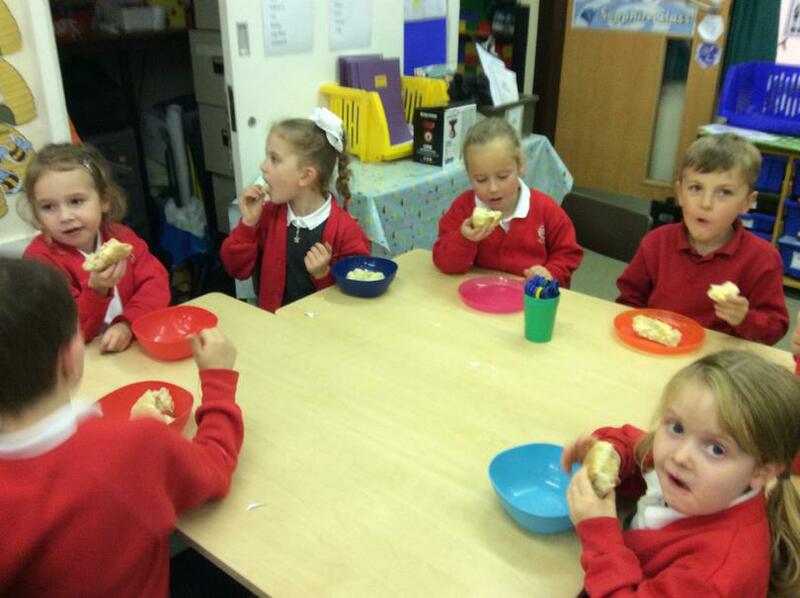 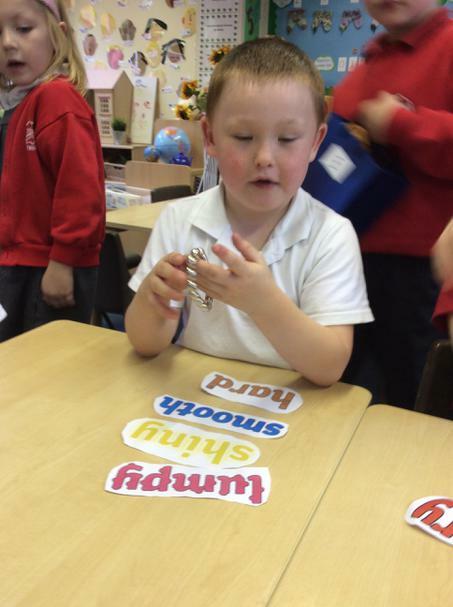 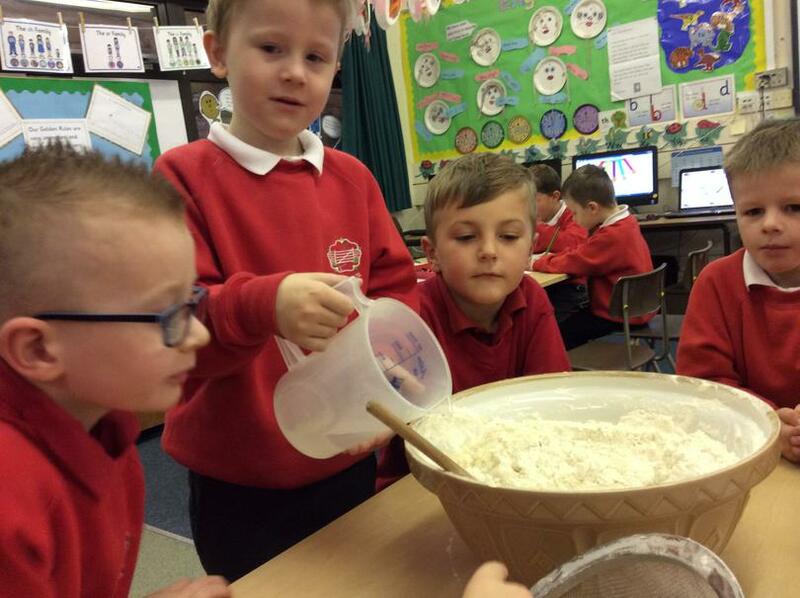 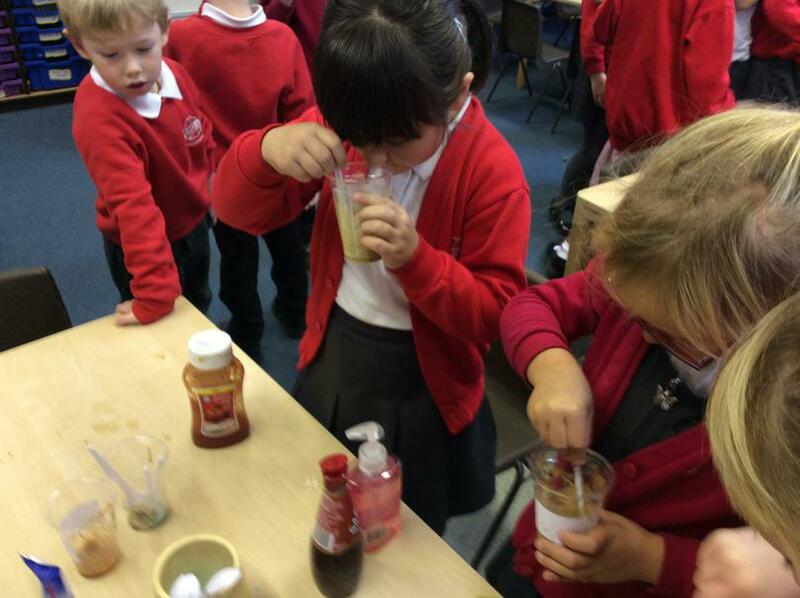 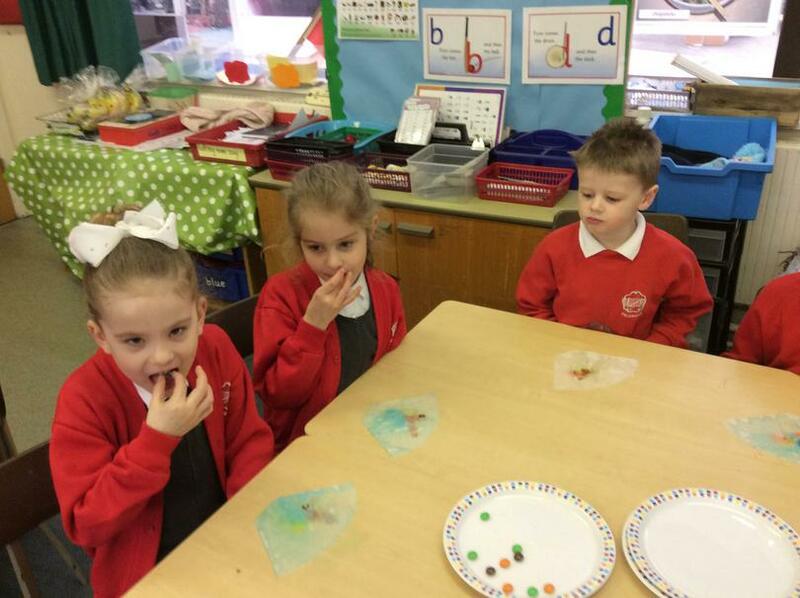 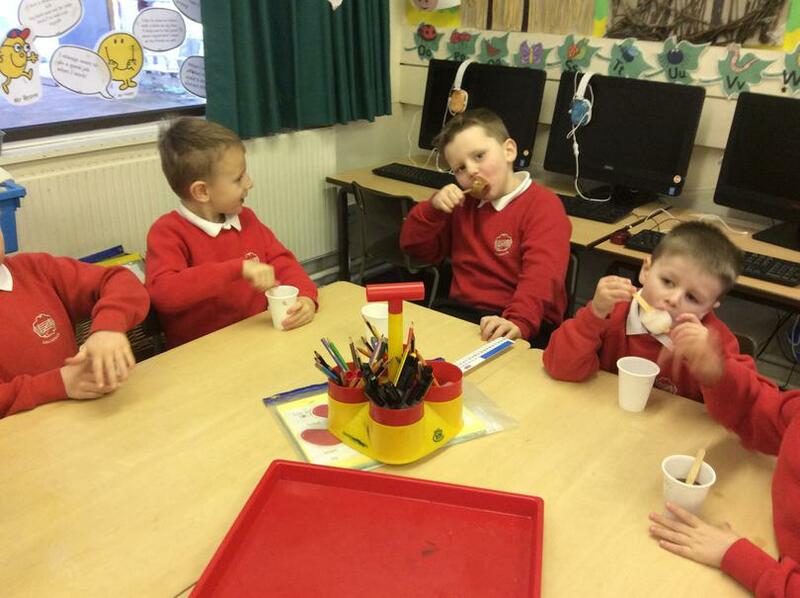 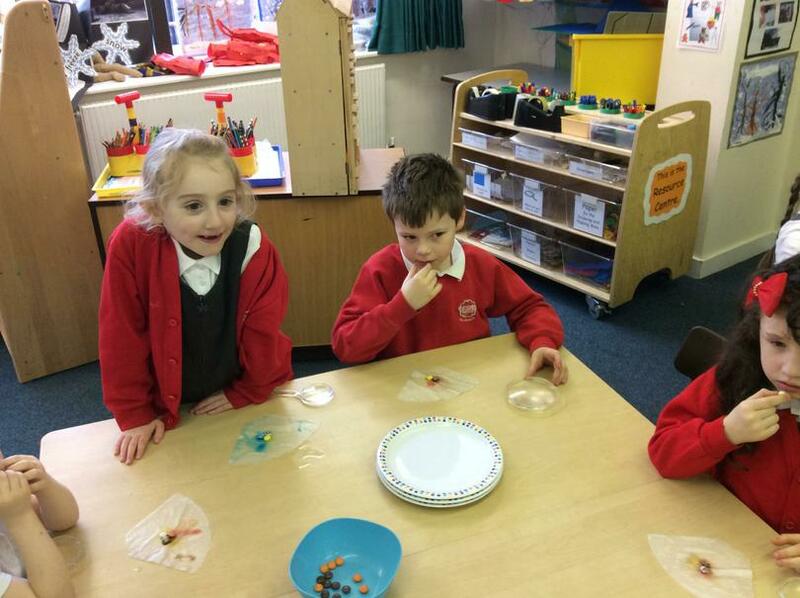 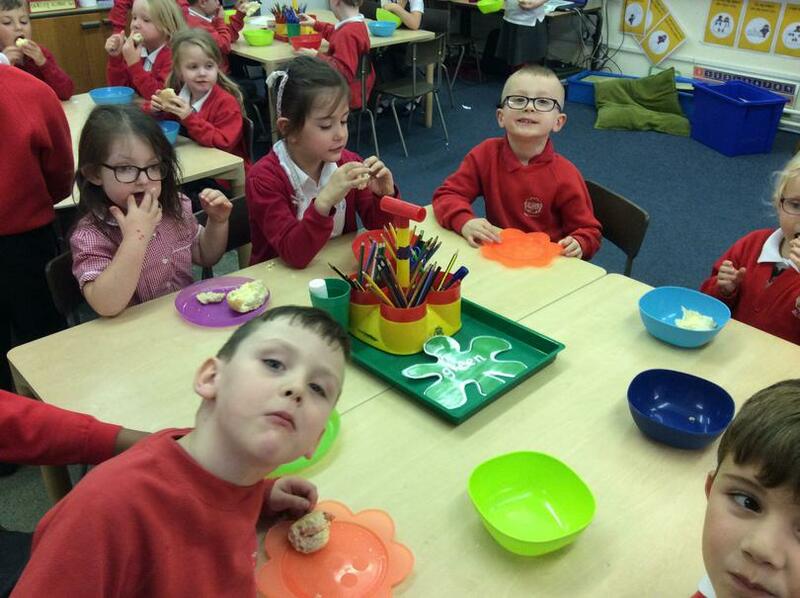 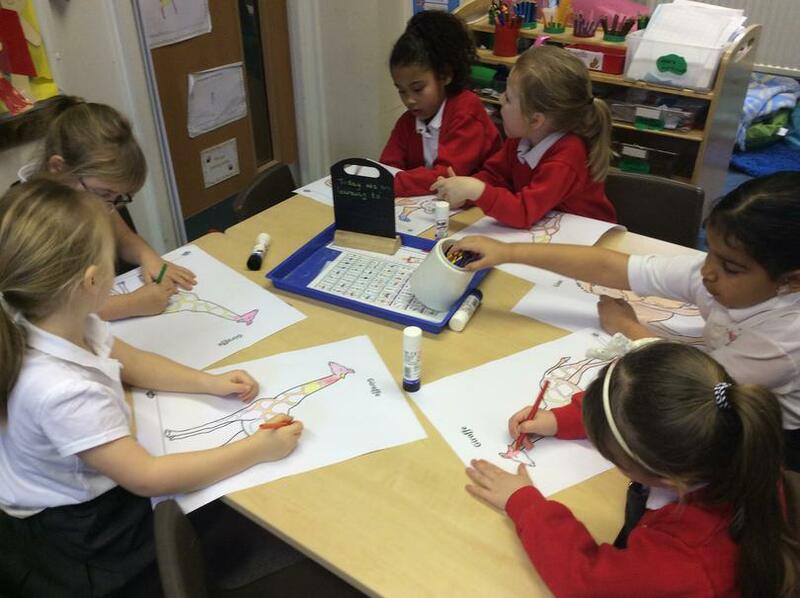 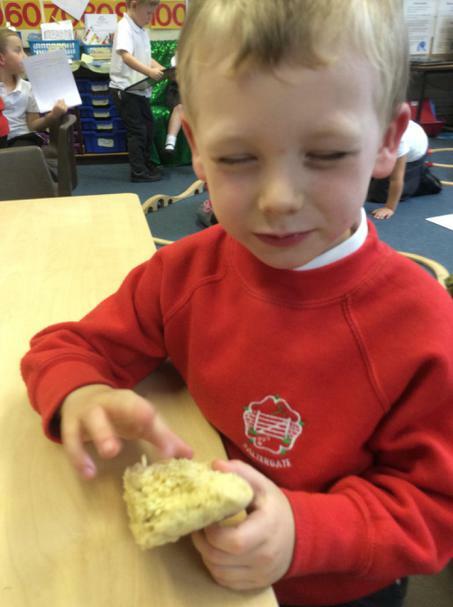 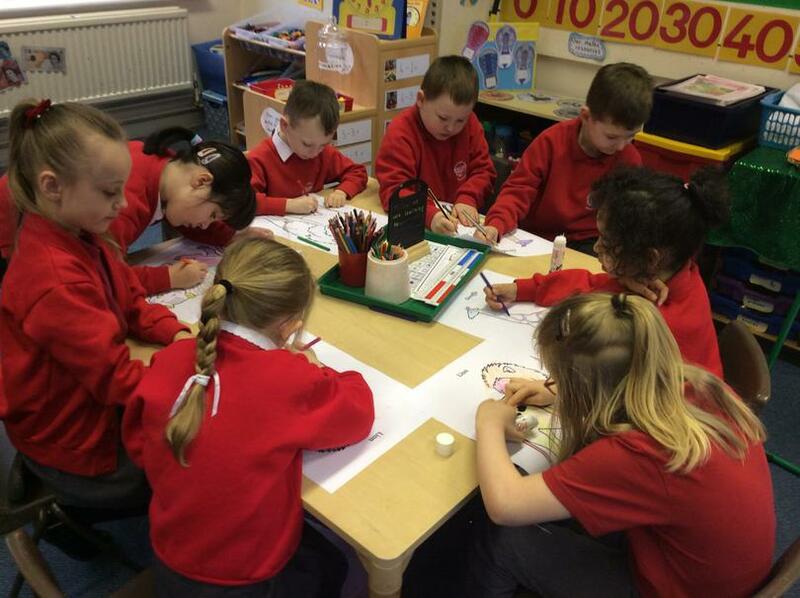 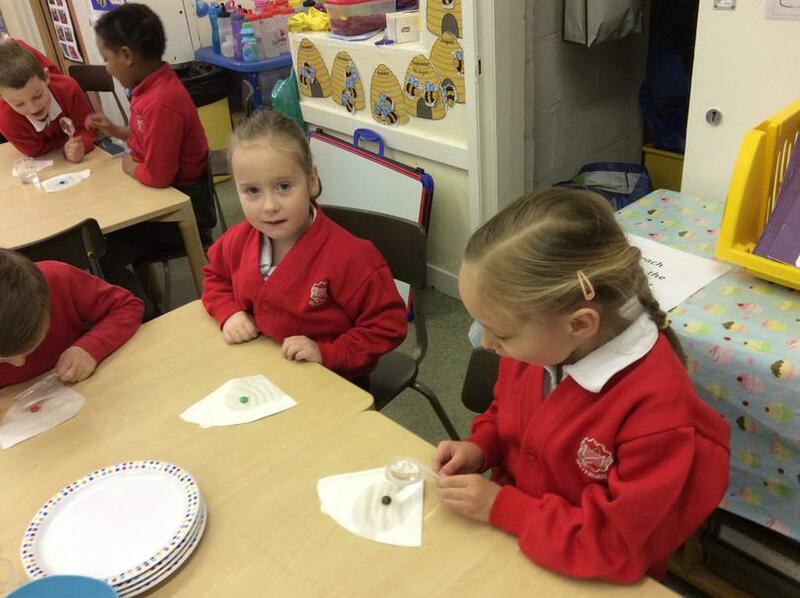 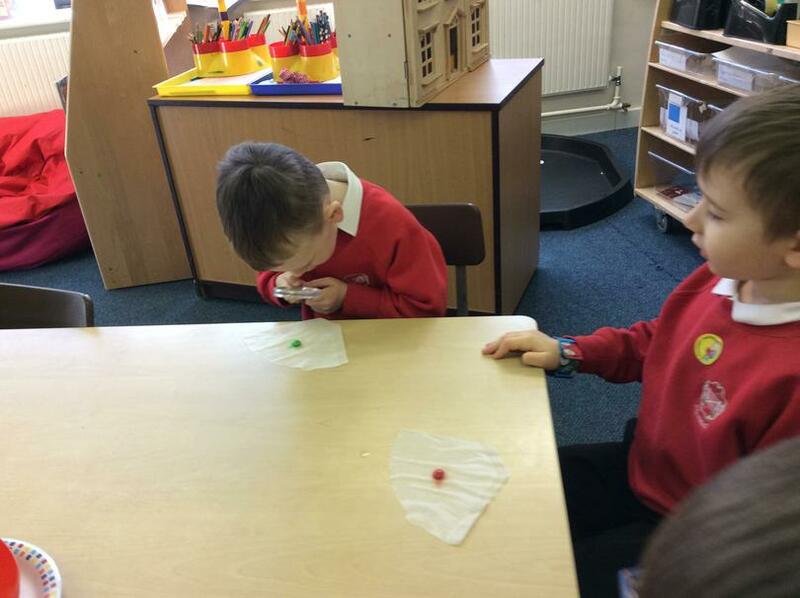 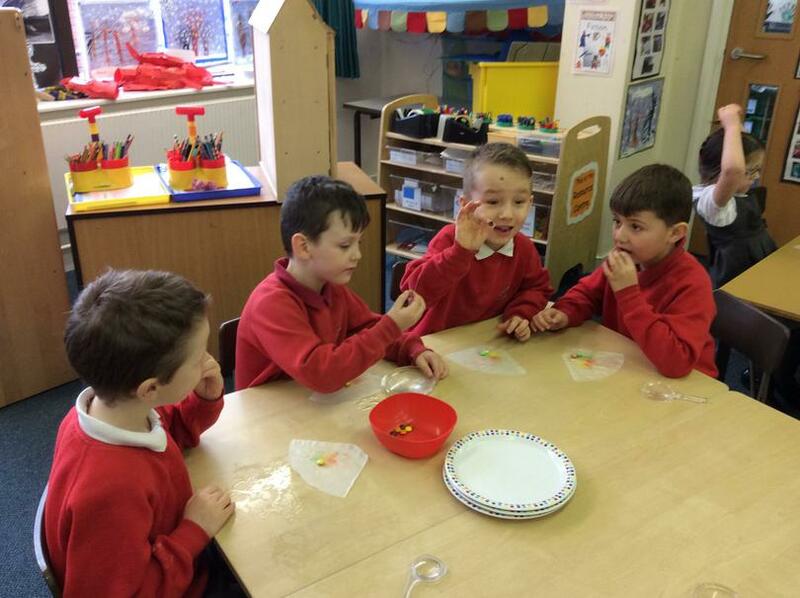 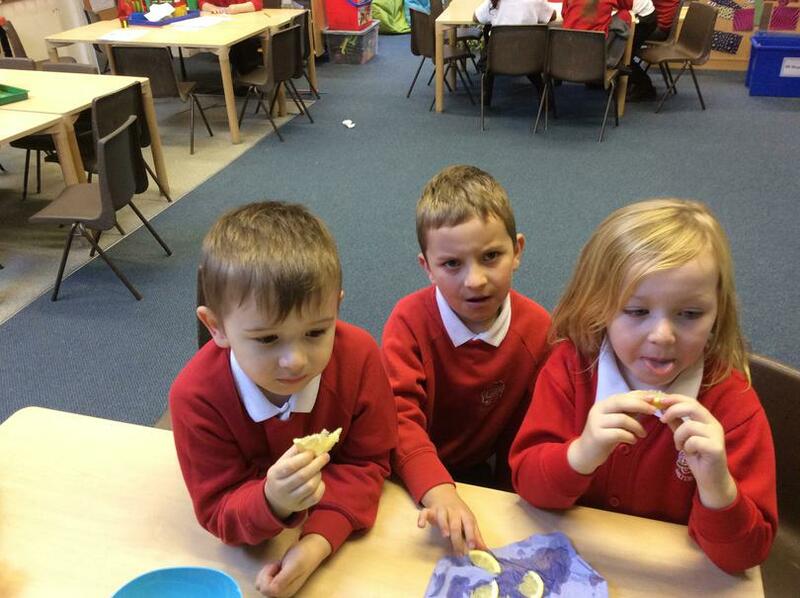 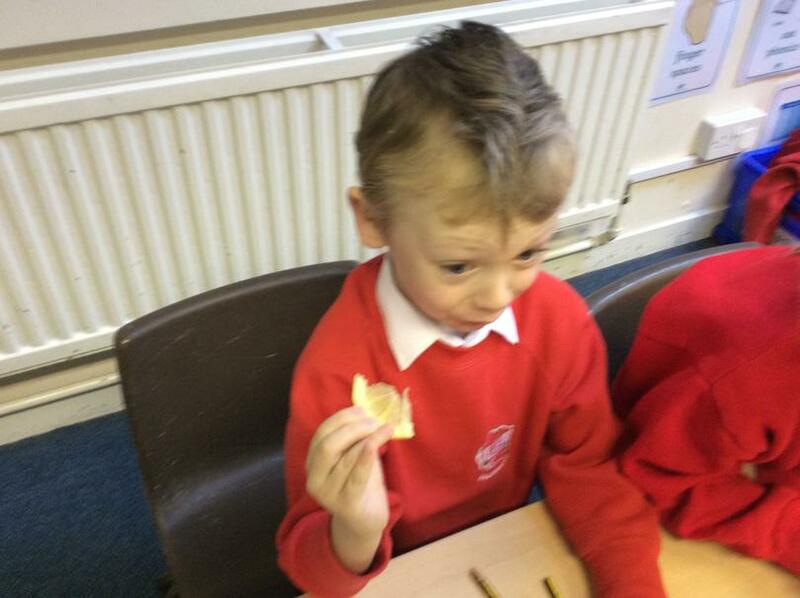 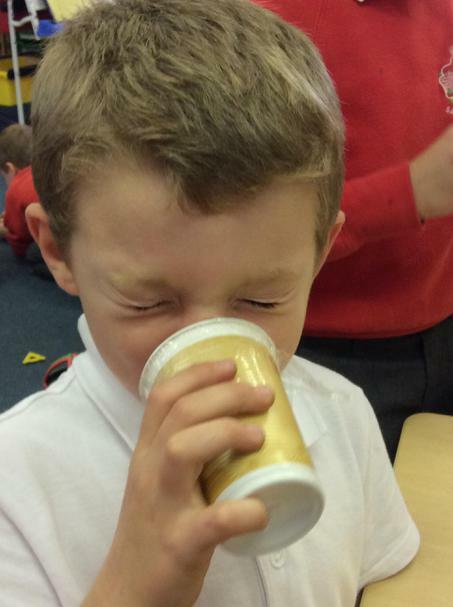 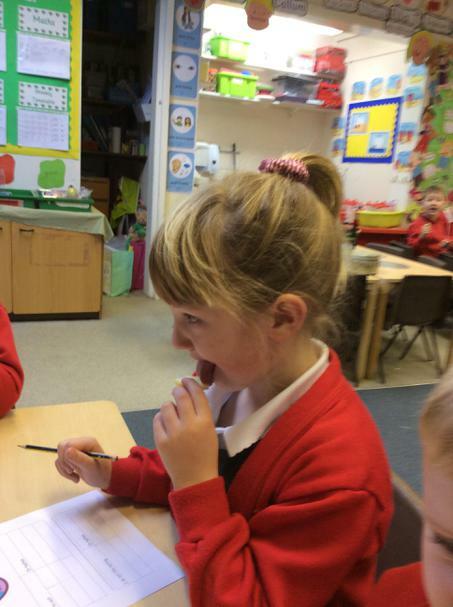 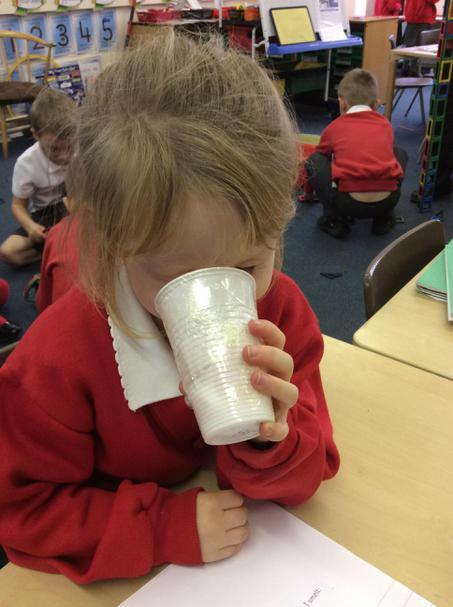 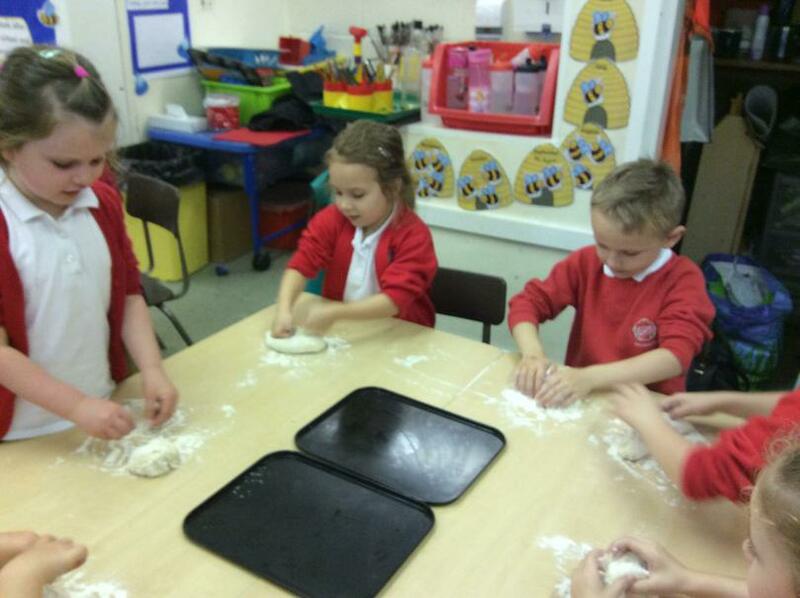 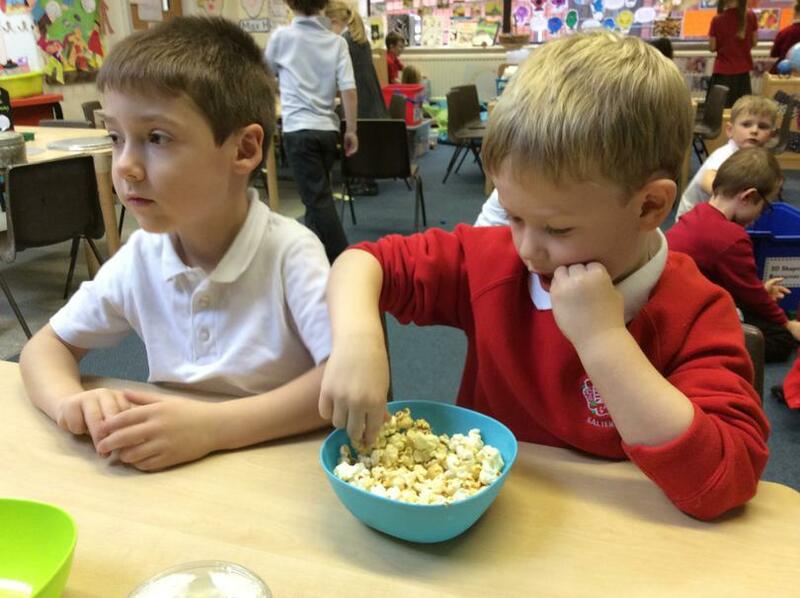 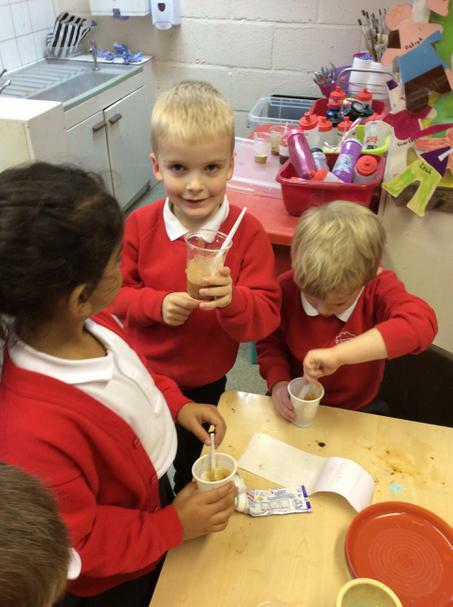 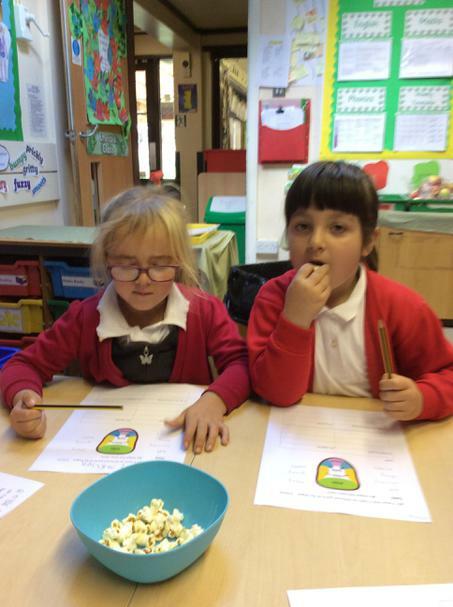 Year One are currently working on the senses, they have had great fun learning about touch, taste and smell. 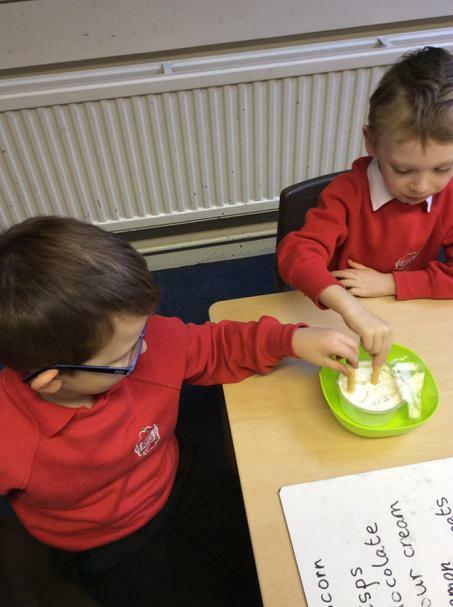 When learning about touch the children made several different texture items to explore this sense as well as matching words to the appropriate texture. 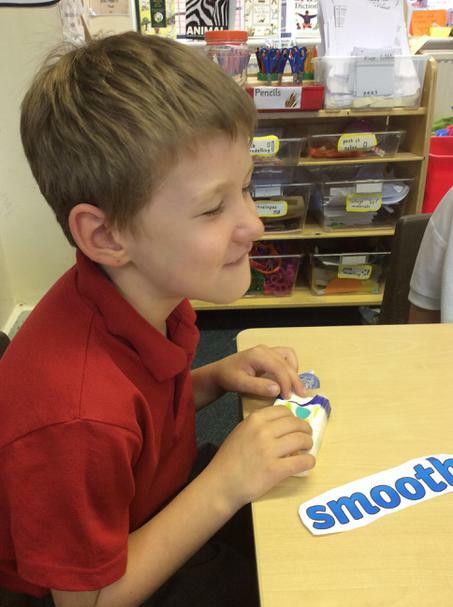 Is it smooth, shiny, lumpy, hard or bumpy? 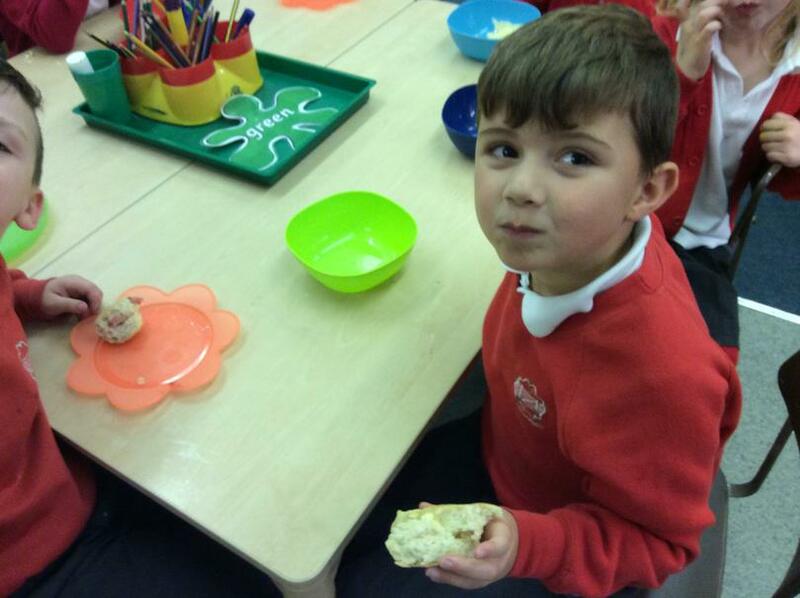 When learning about taste the children made bread (and ate it which was delicious) and also had to identify certain characteristics of taste. 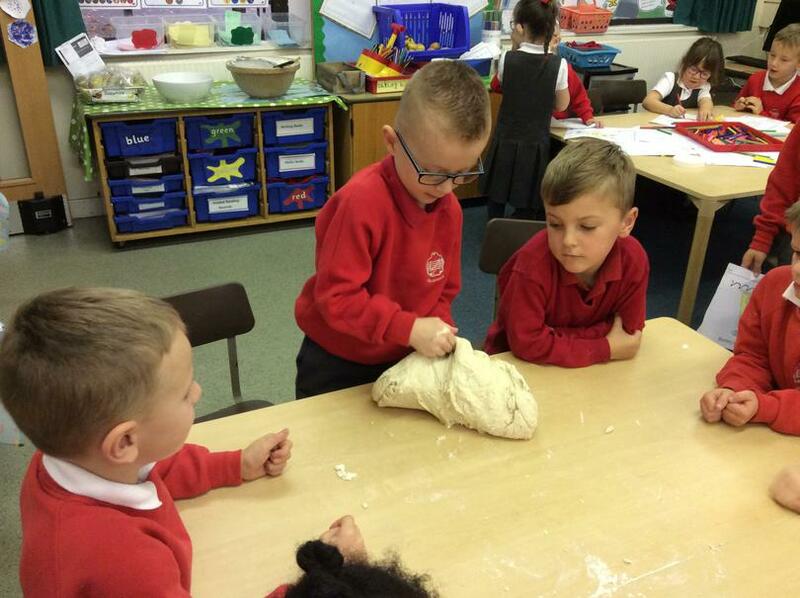 Shaping the bread and putting it in the oven (always making sure an adult puts it in the oven). 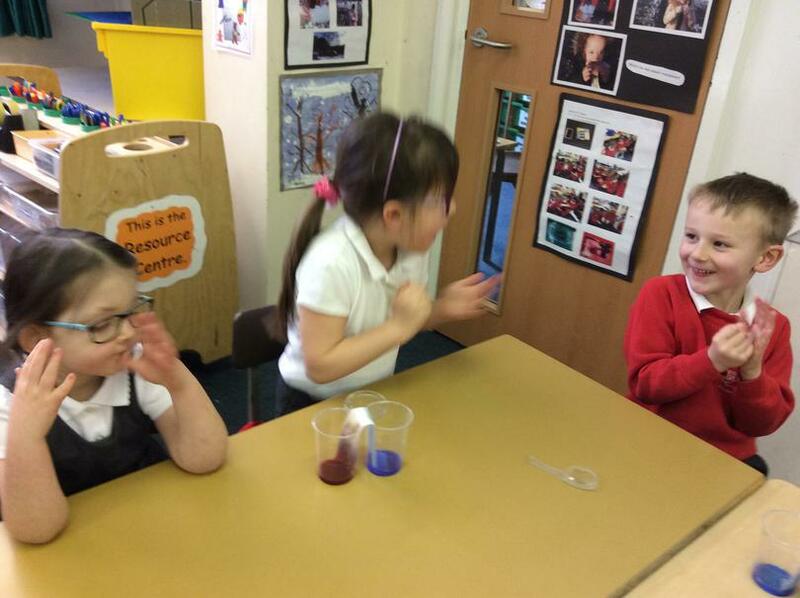 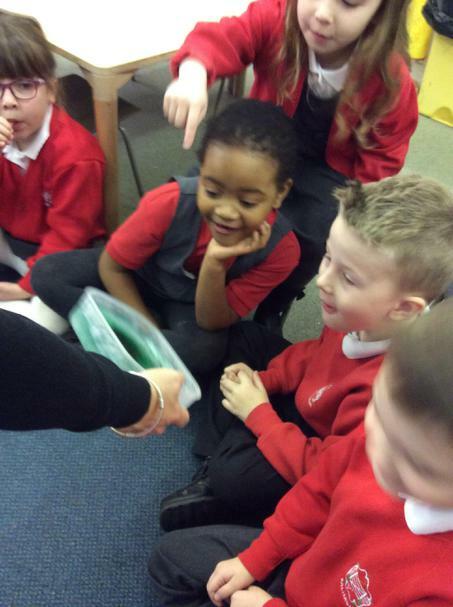 When learning about smell the children made smelly potions and had to guess the smell hidden inside a pot. 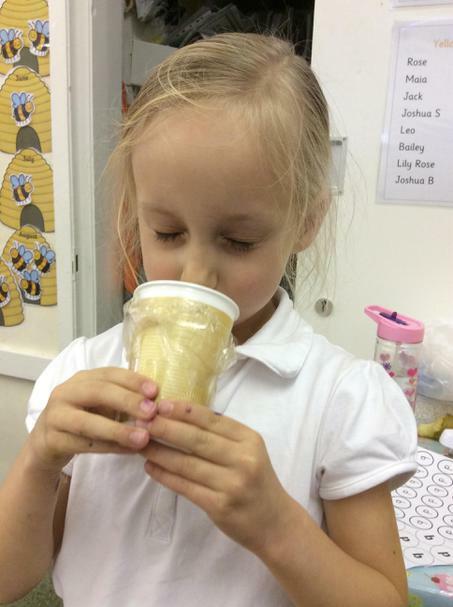 Having fun making lots of smelly pots. 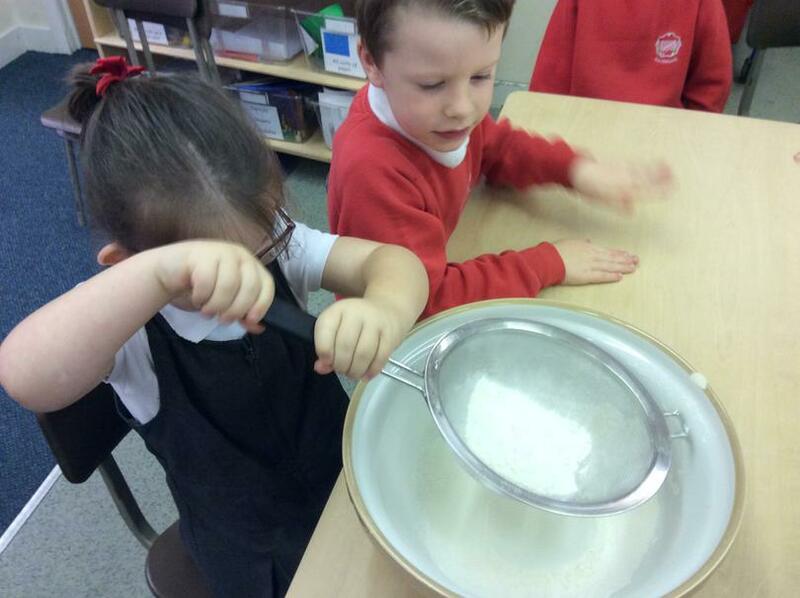 Guessing what smell is in which pot, the smells ranged from orange, lemon, soap and coffee. 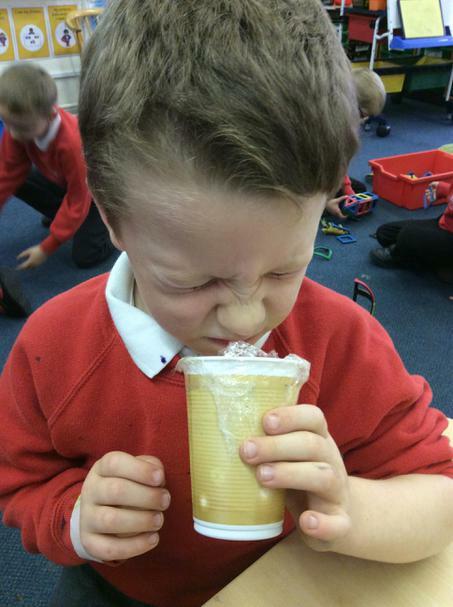 Which of these smells would you like?